Going by luxury touring coach bus from Hanoi to Sapa in a relaxed way with your own soft coach seat, travel in a relax way to Sapa & return! 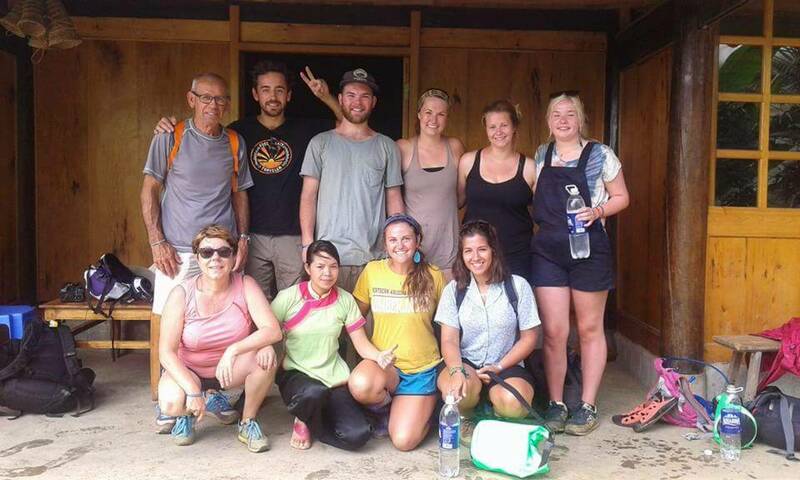 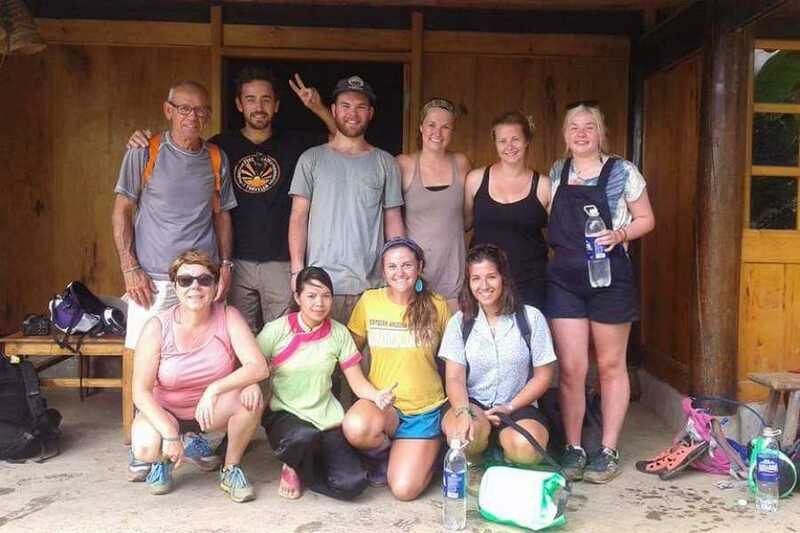 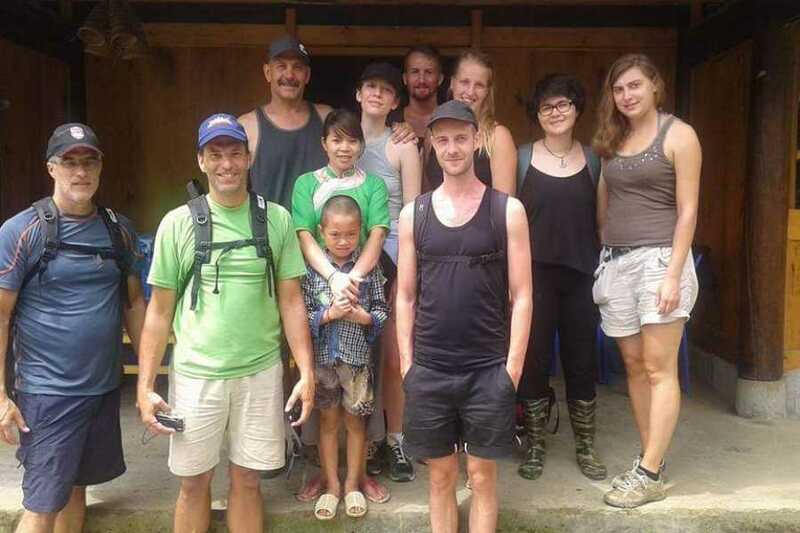 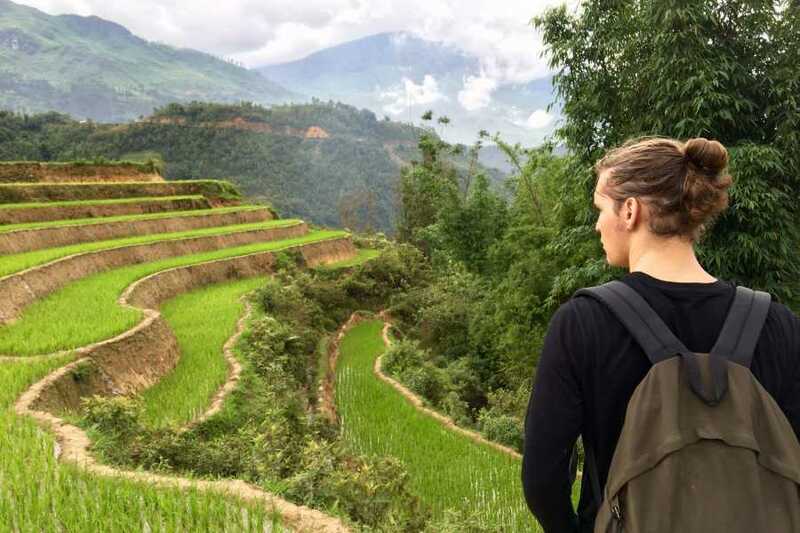 Designed with great variety, these trekking experience are geared towards travellers searching for a healthy mix of active exploration, uncommon landscapes, unique non-touristic trekking and local cultures. 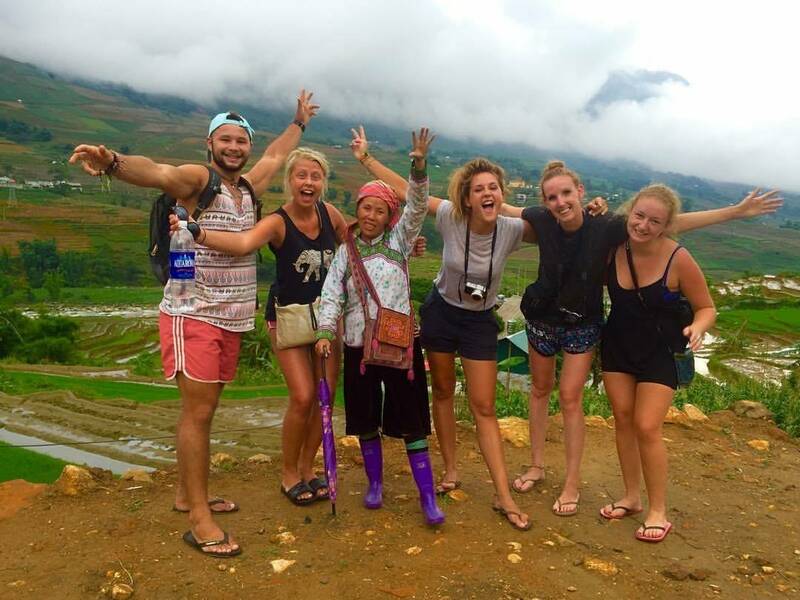 * As we would like to surprise you about our quality & services all our tour prices are included as mentioned in our itinerary. 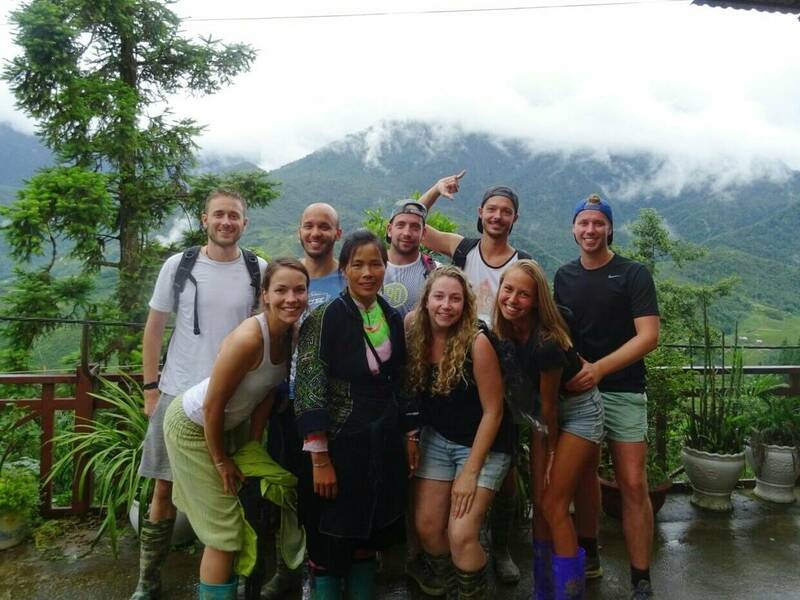 Our pricing is only applicable as individual or group bookings as mentioned in our price table, price based on atleast 2 people booked. 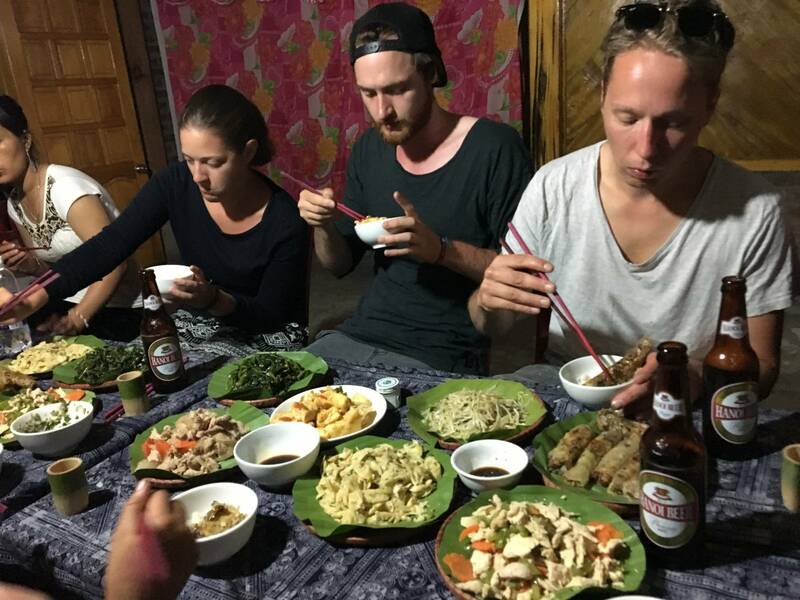 In general you only need some pocket money for your personal expenses as for your drinks. 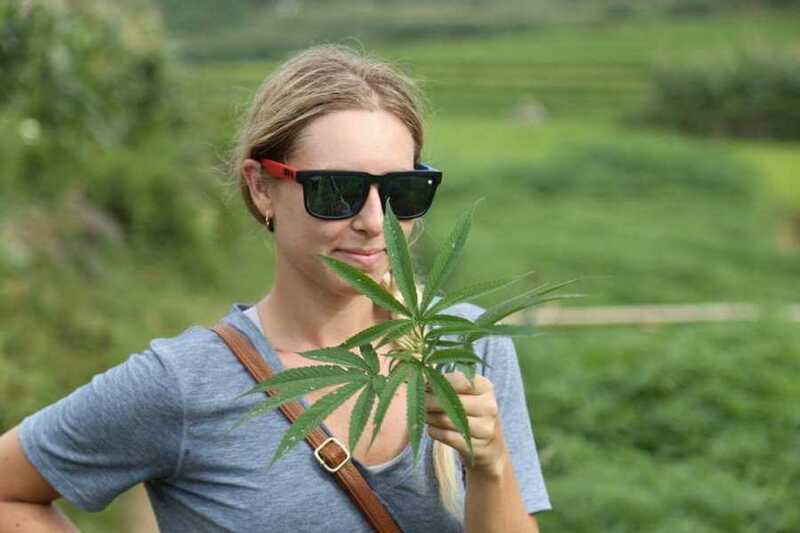 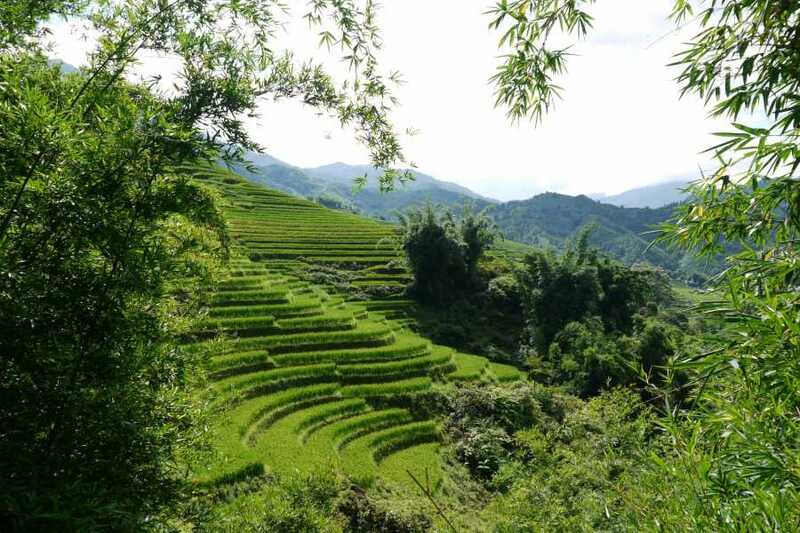 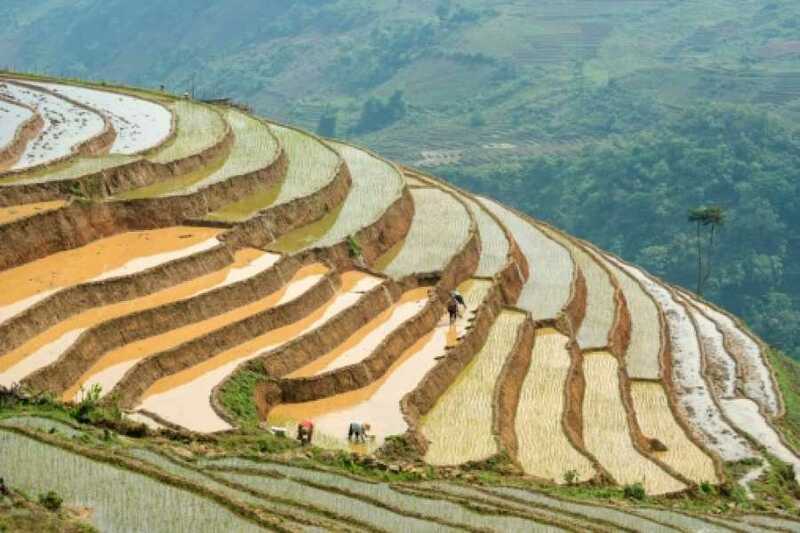 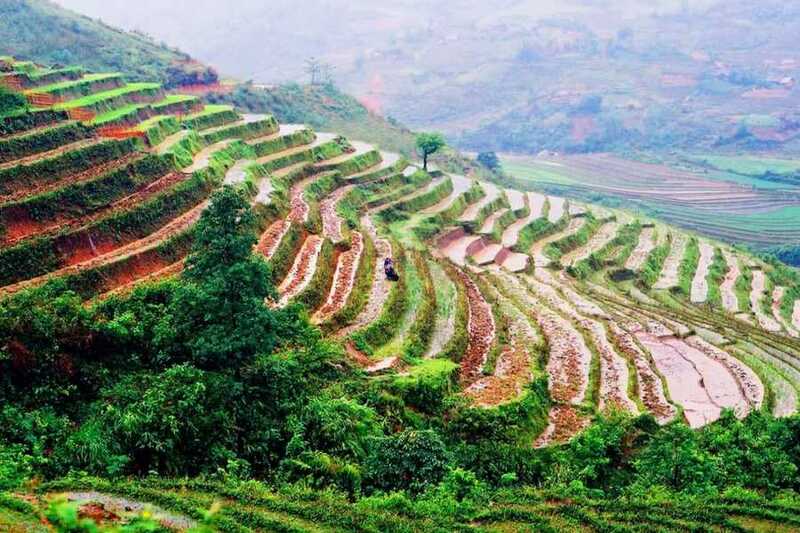 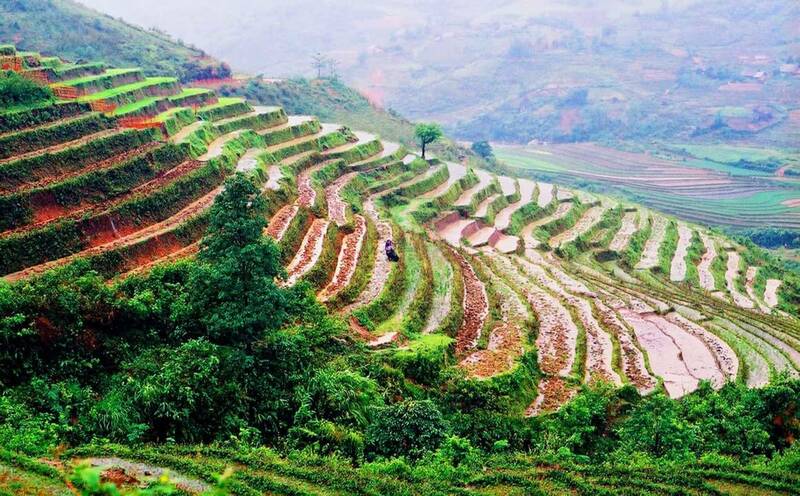 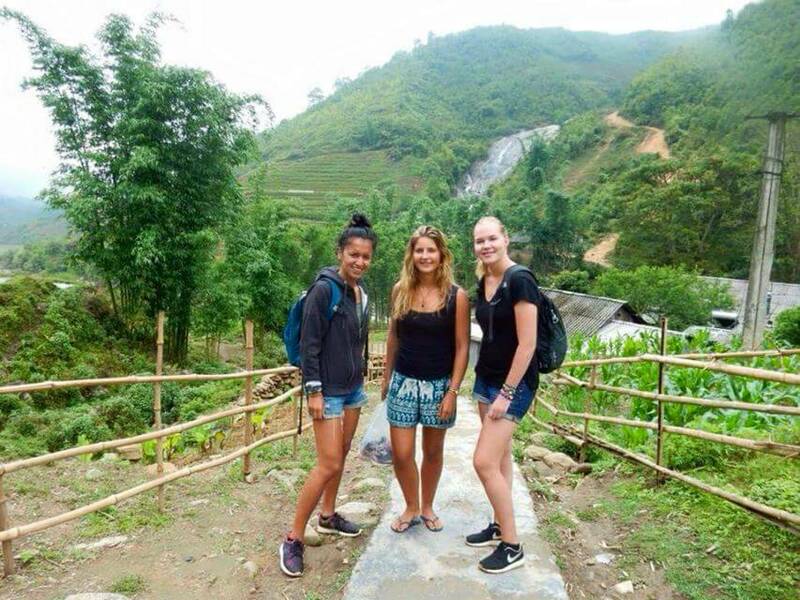 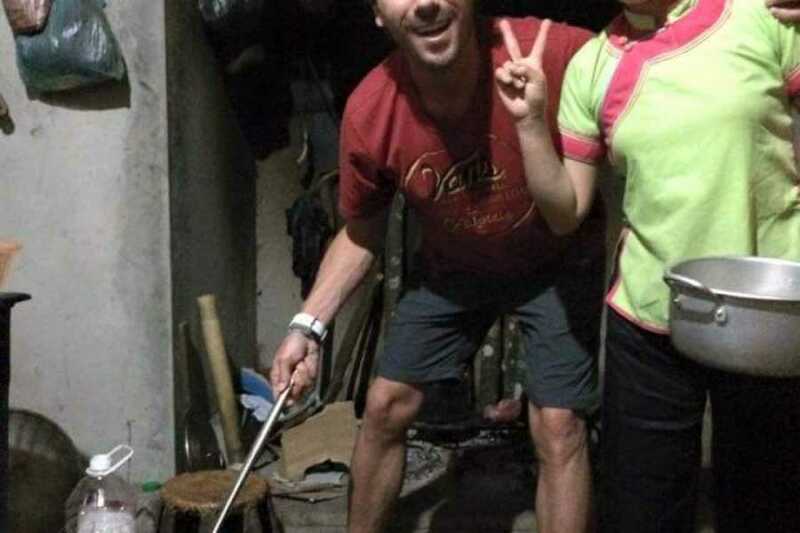 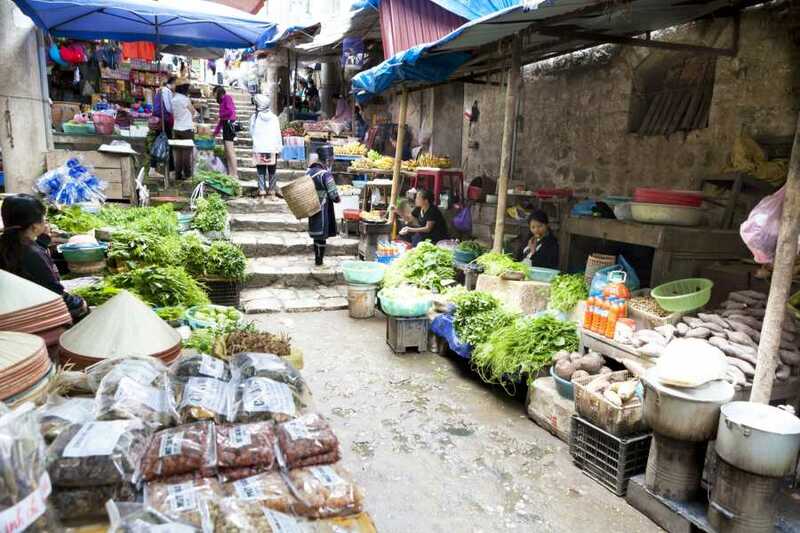 You booked a comfortable drive with the morning & afternoon coach bus from Hanoi to Sapa town and return you be will required finding on your own the way on your arrival in hanoi to your hotel or stay. 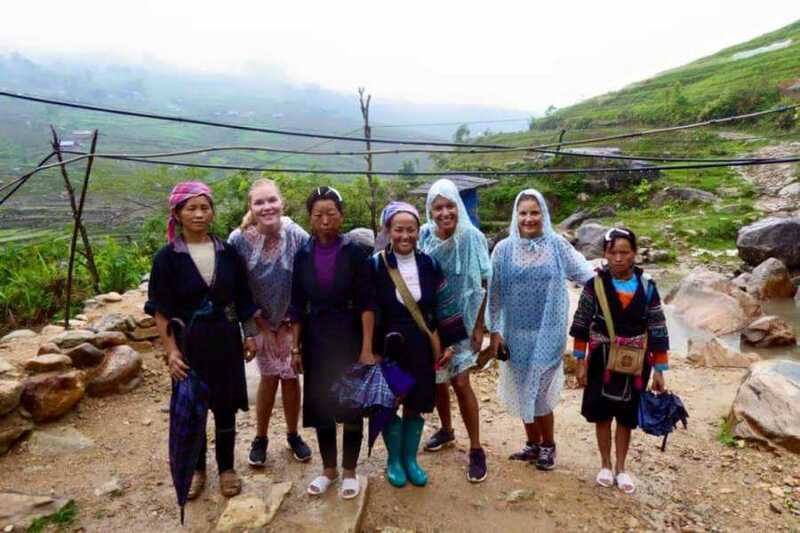 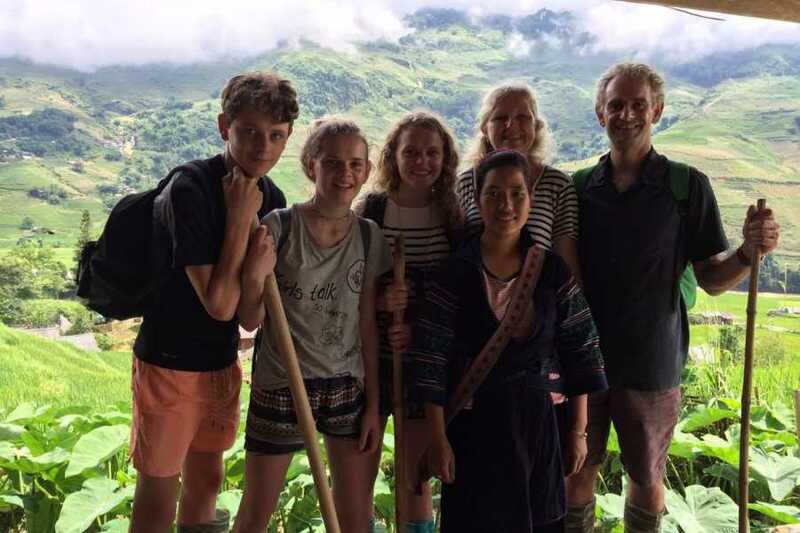 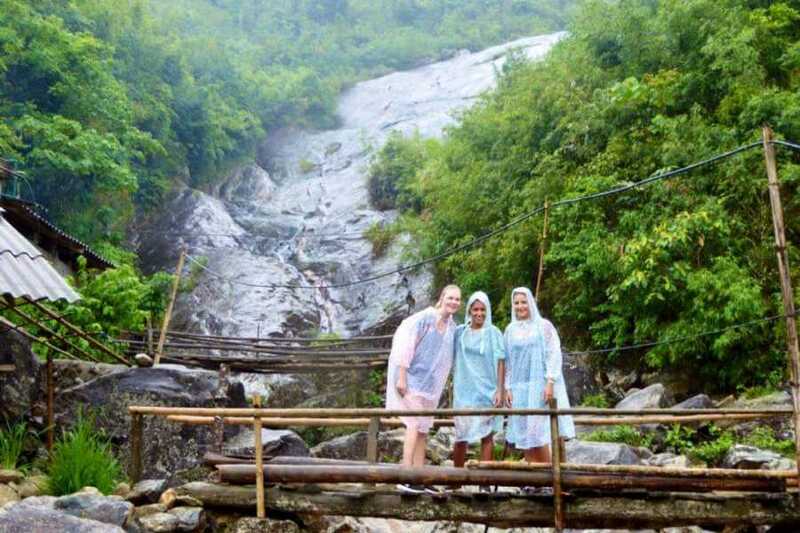 We depart daily at 6:30AM by luxury touring coach bus from Hanoi at around 1PM after a really comfortable drive with the morning coach bus from Hanoi we arrive in Sapa this afternoon. 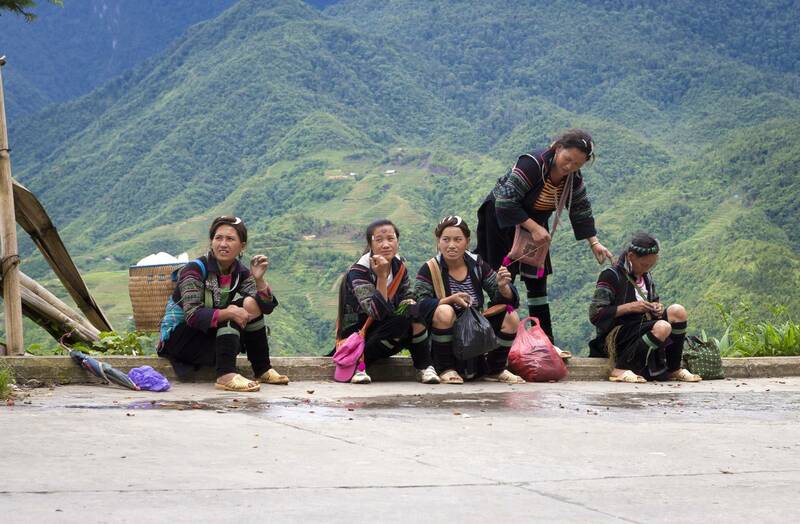 The bus is air-conditioned and doesn't have toilets on board your luggage can be stored under the bus. 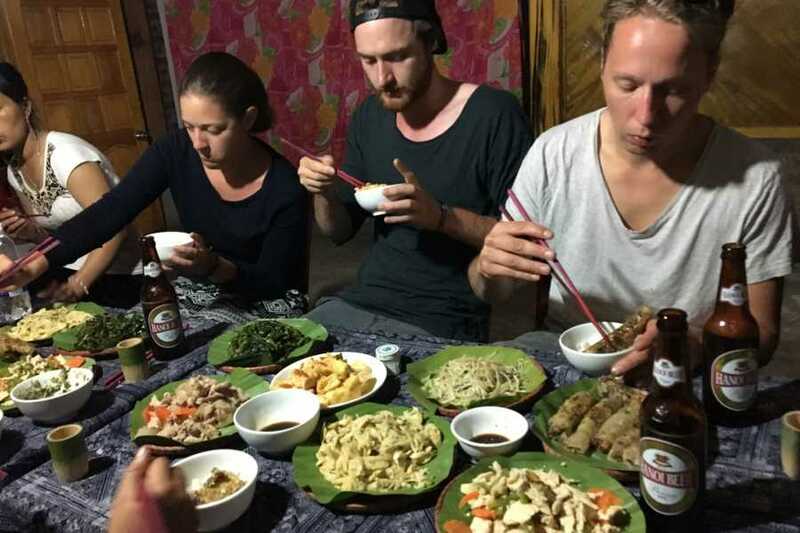 Food and drinks are not available for purchase on the bus. 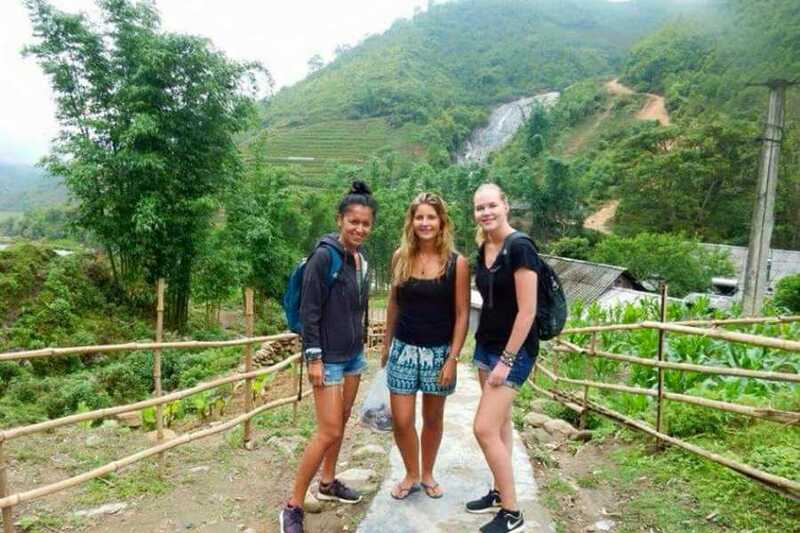 The bus might stop 2 times on the way. 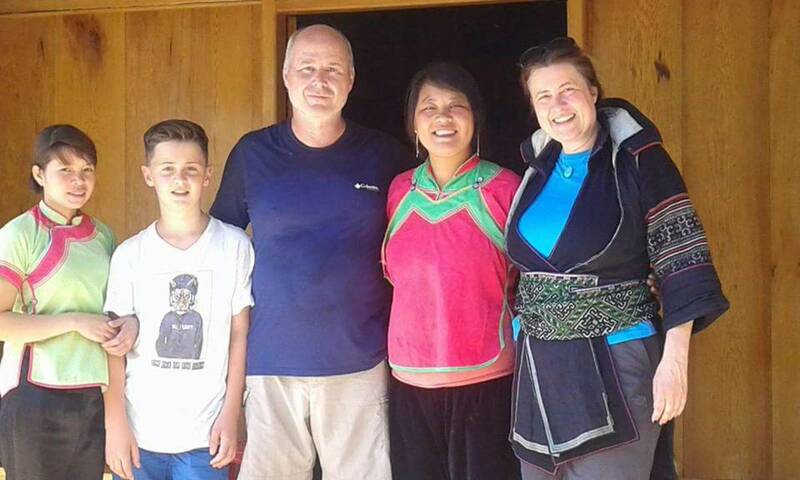 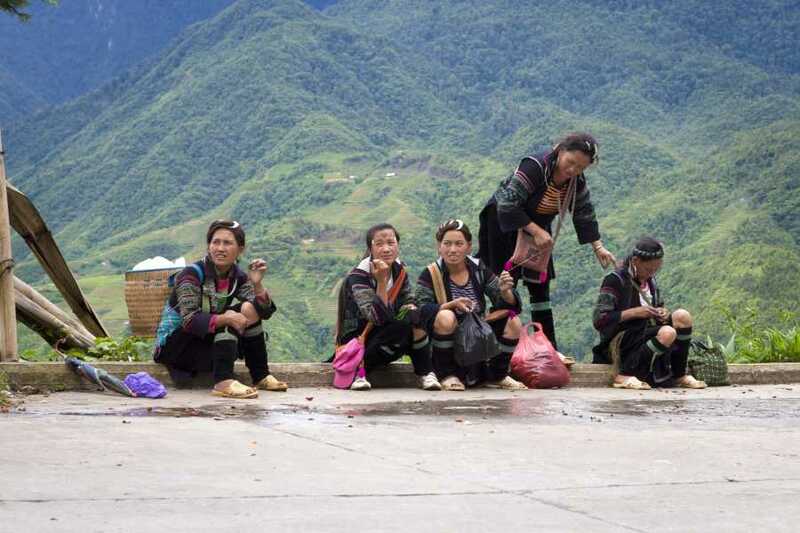 On arrival in Sapa our local Hmong or Red Dzao tour guide is waiting you at the bus meeting point together with our driver for a 30 min drive. 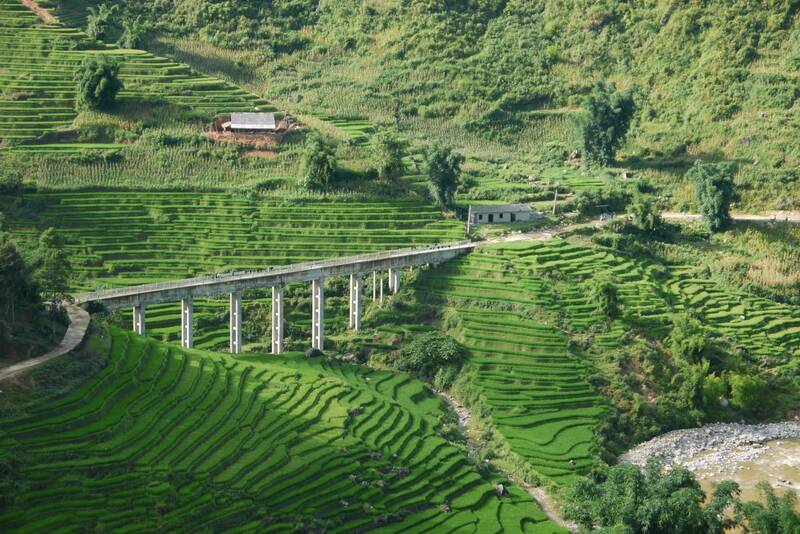 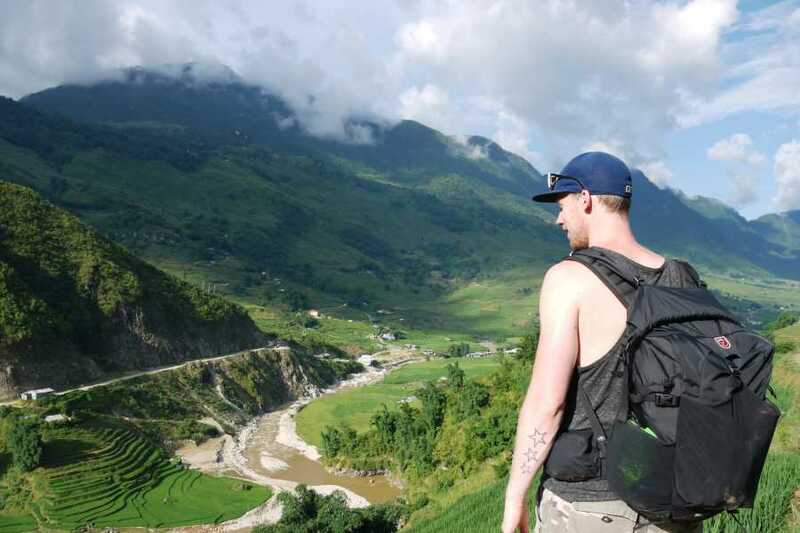 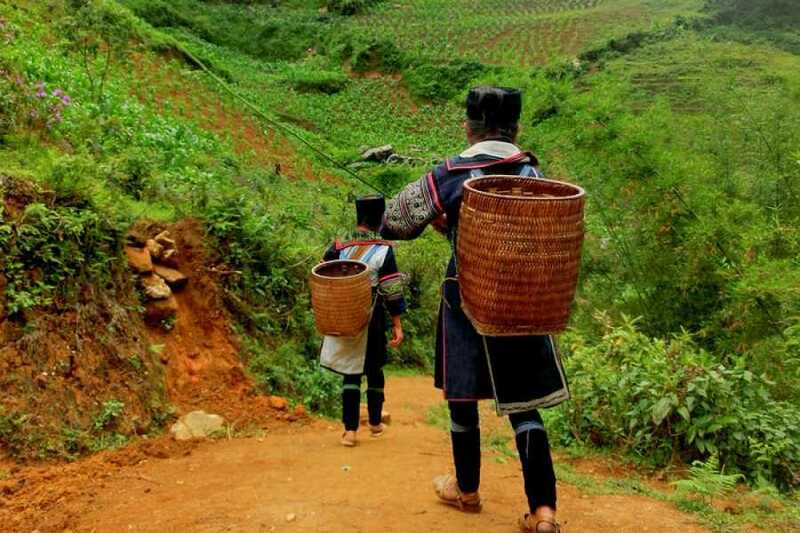 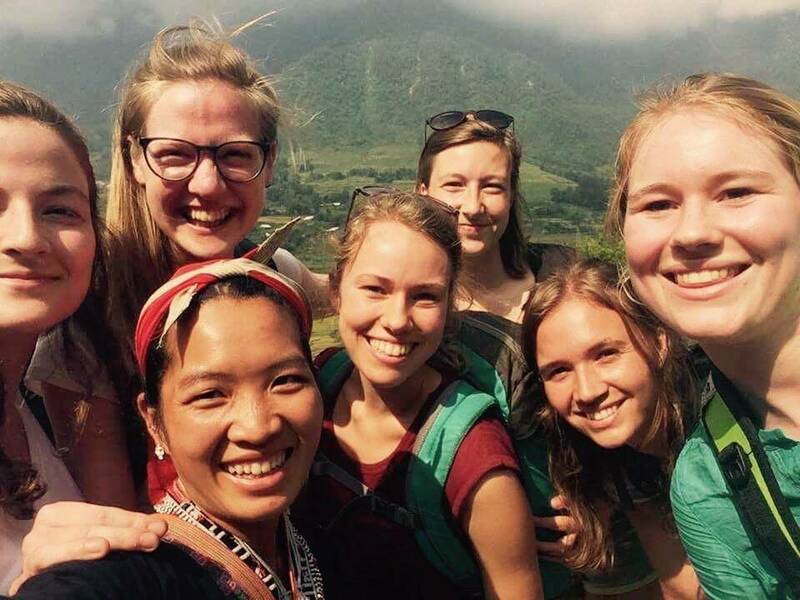 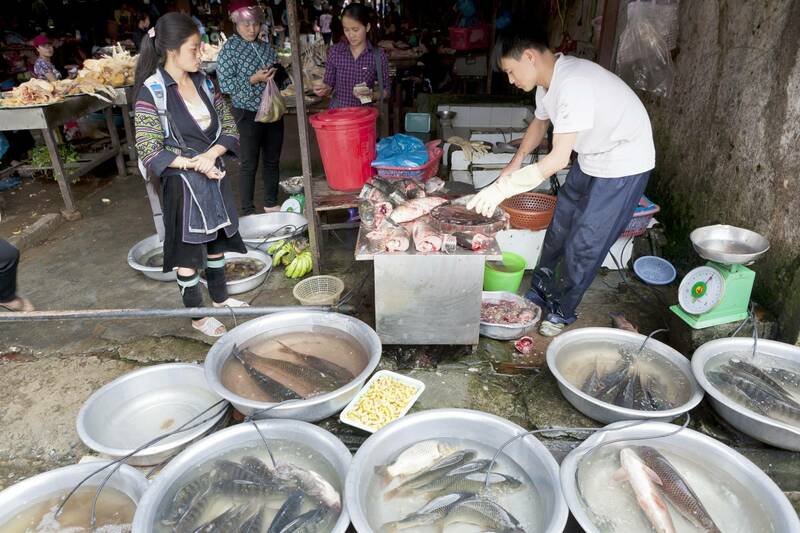 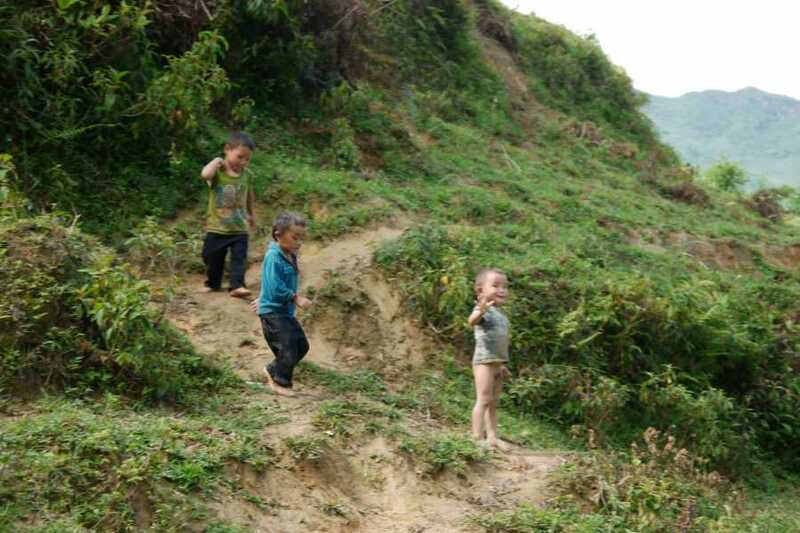 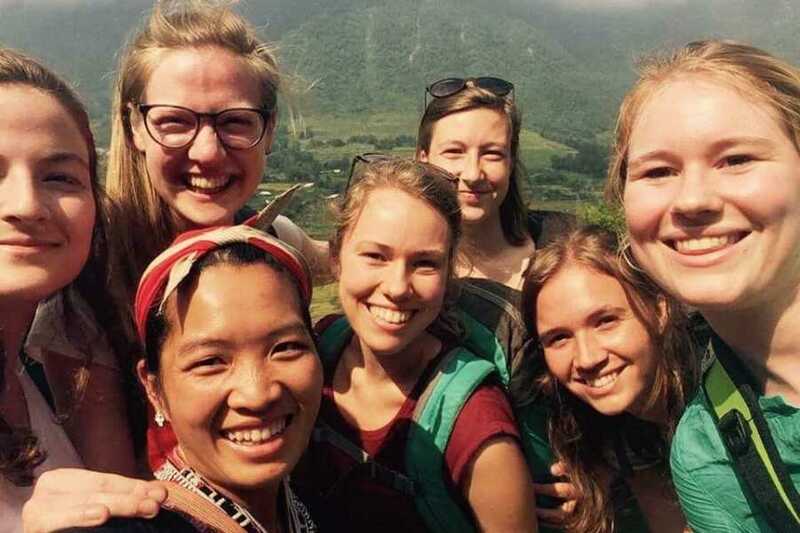 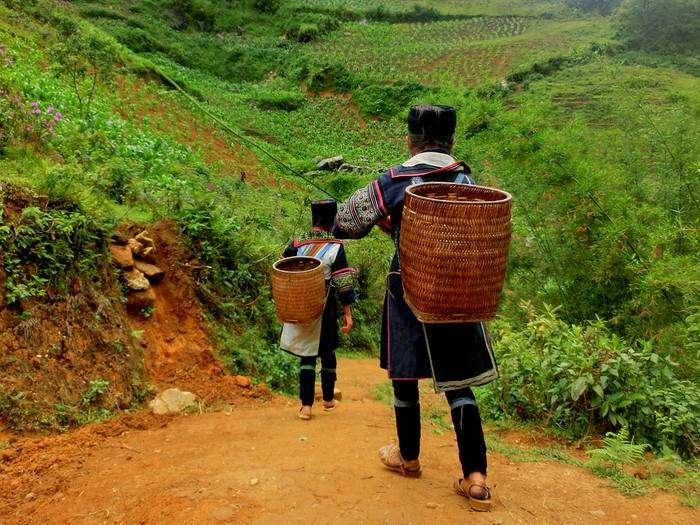 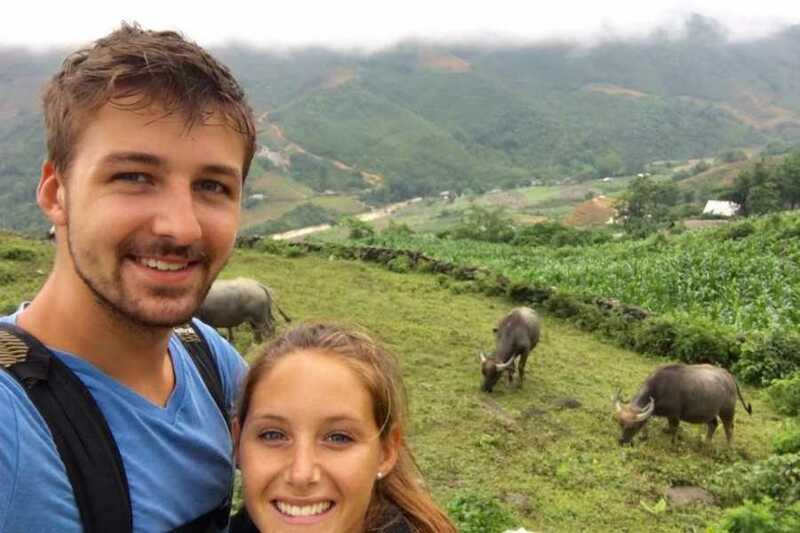 Our guide will guide you through this stunning piece of Vietnam. 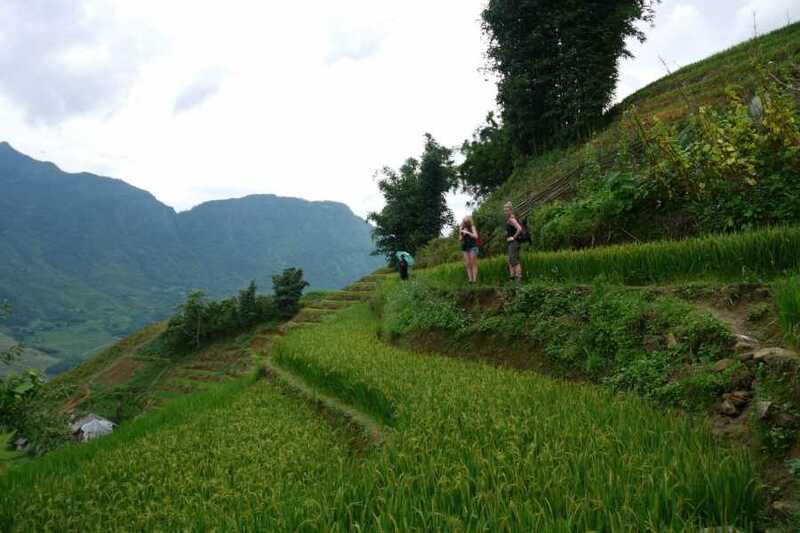 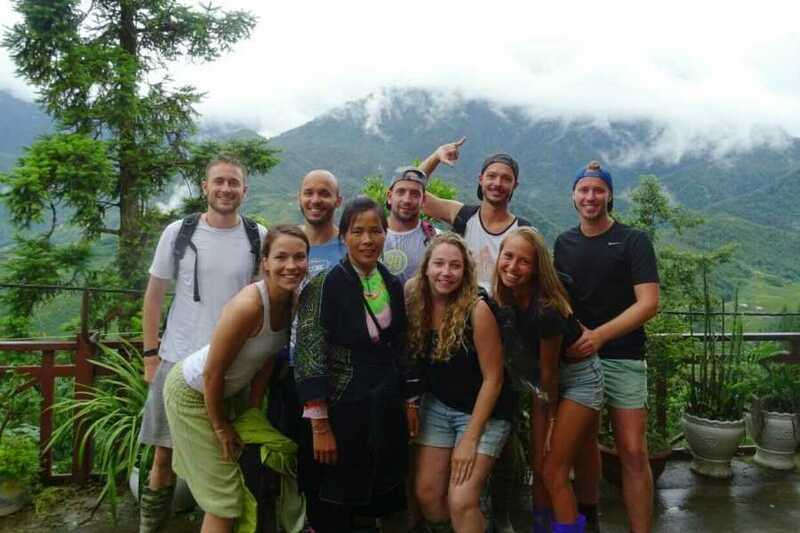 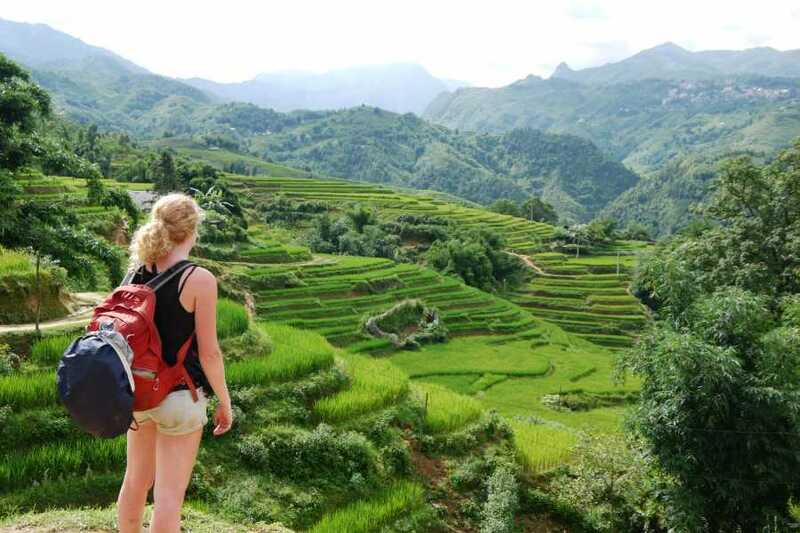 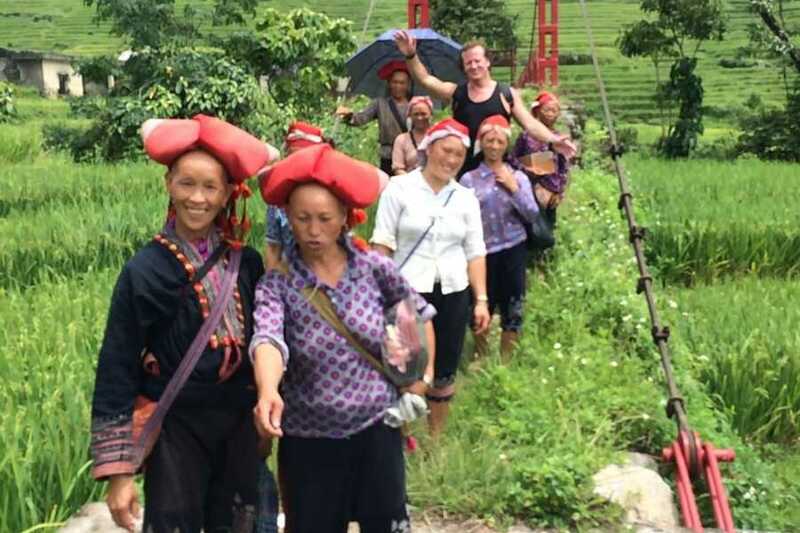 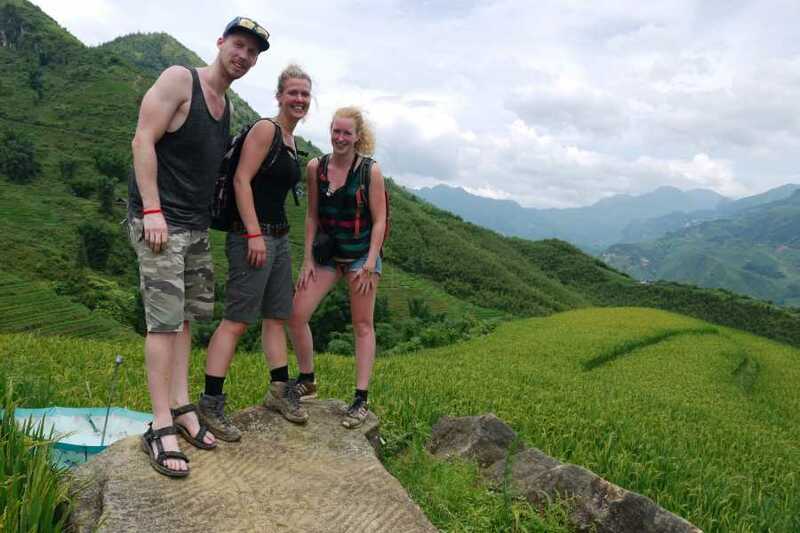 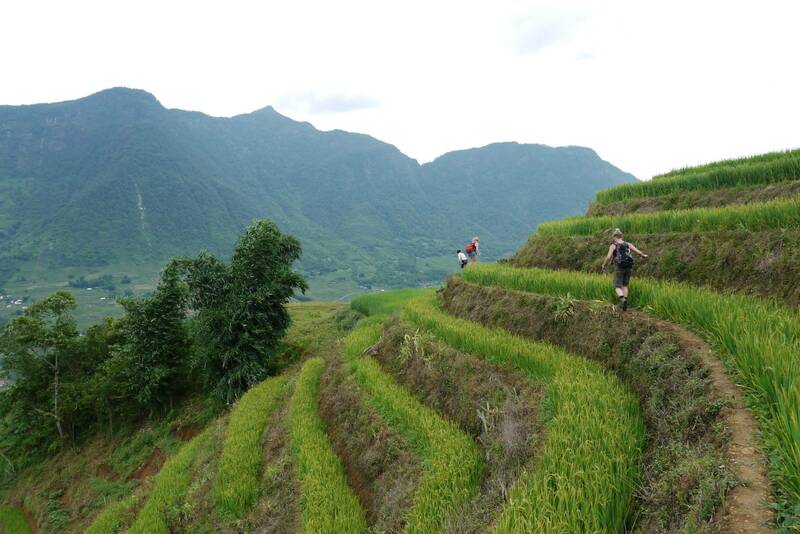 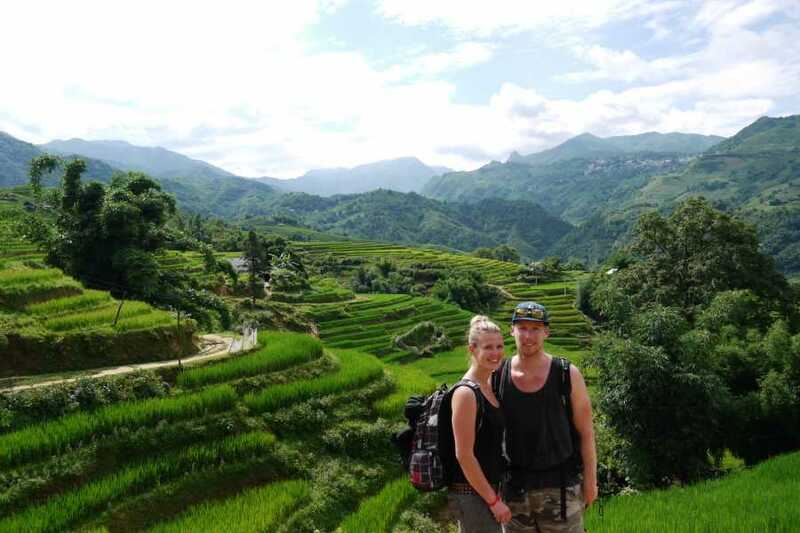 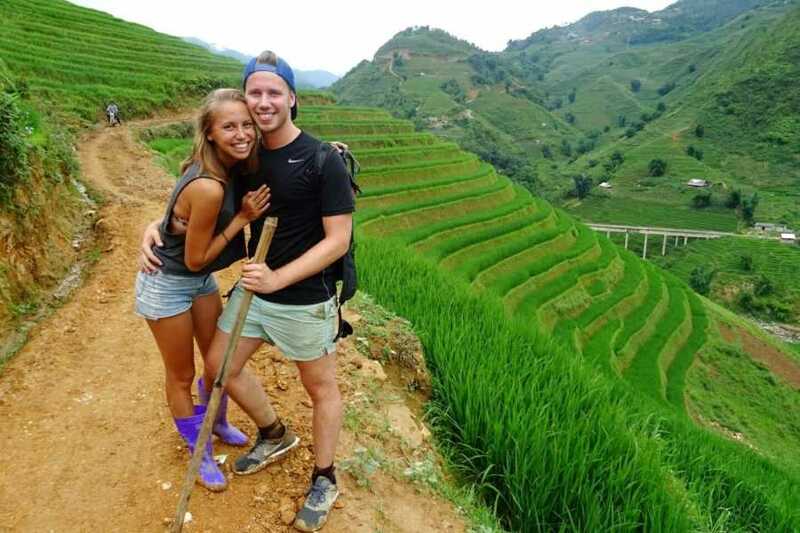 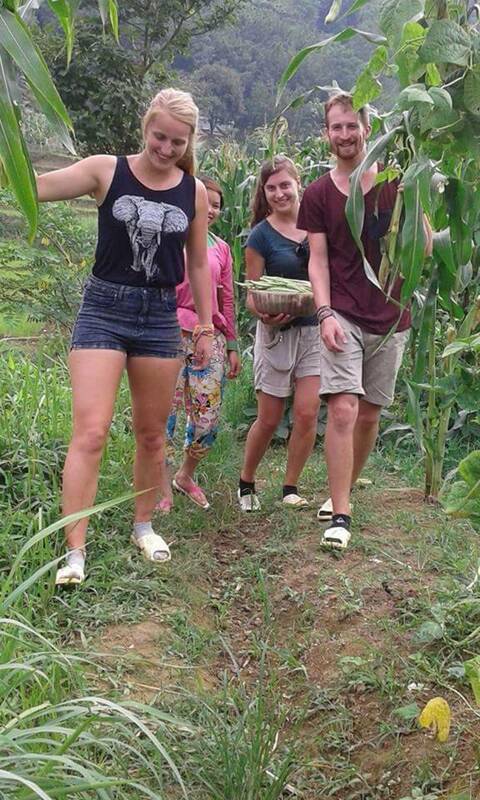 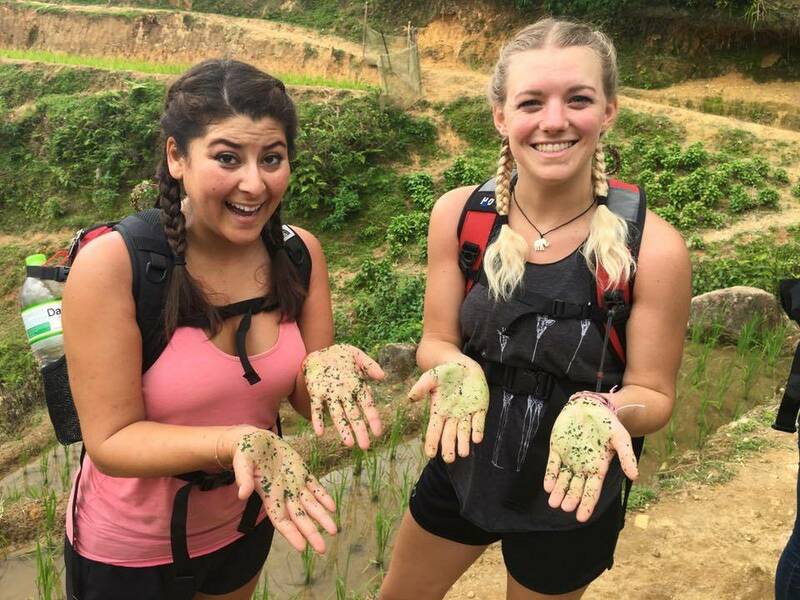 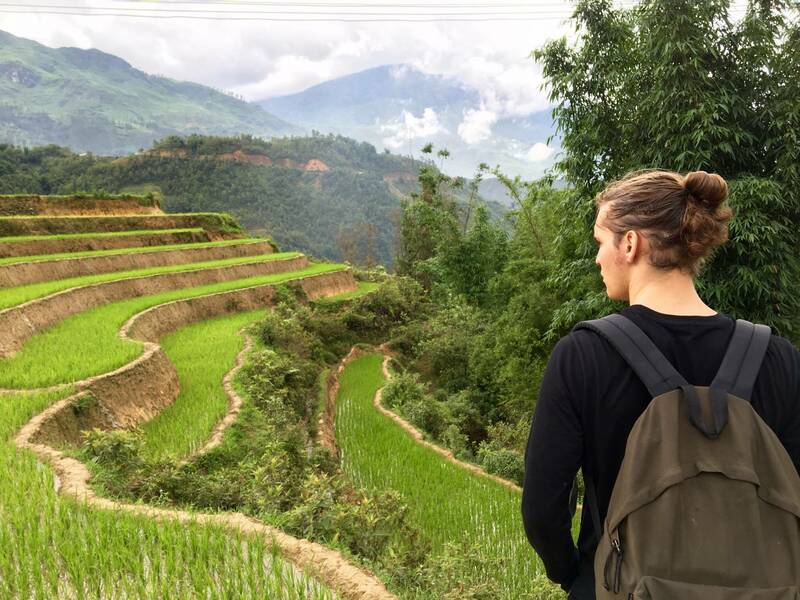 From the lush terraced rice paddies to the rustic charm of the native dwellings, where we trek on the rice paddy fields and buffalo tracks on a less-non touristic & unique terrain can be steep at times and slightly challenging. 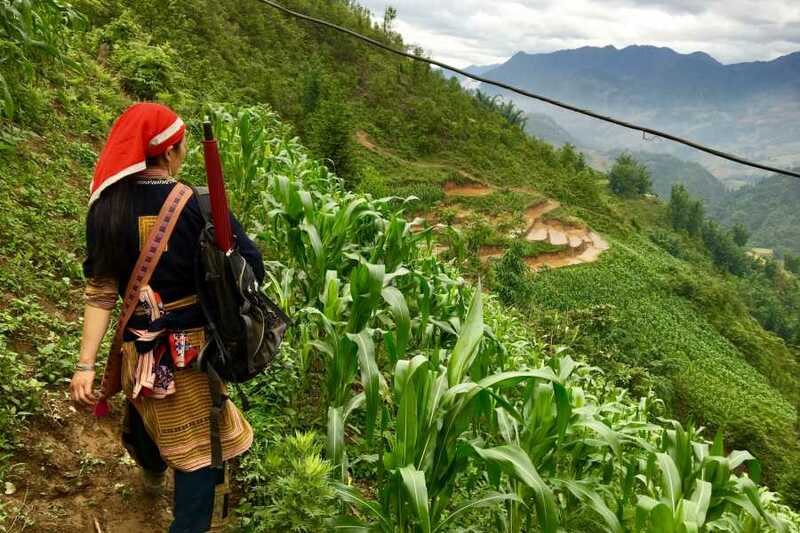 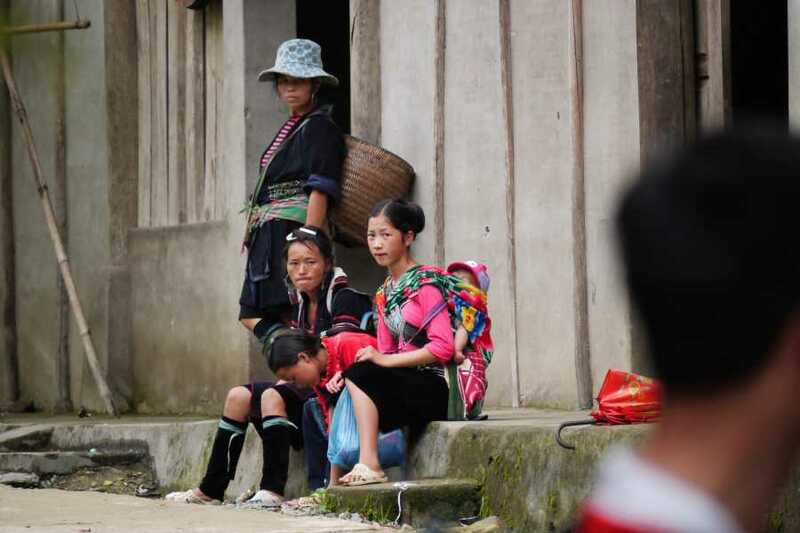 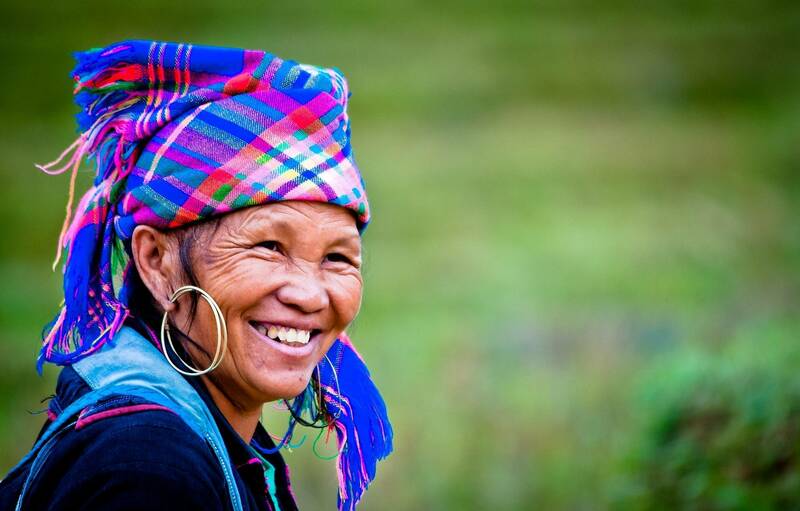 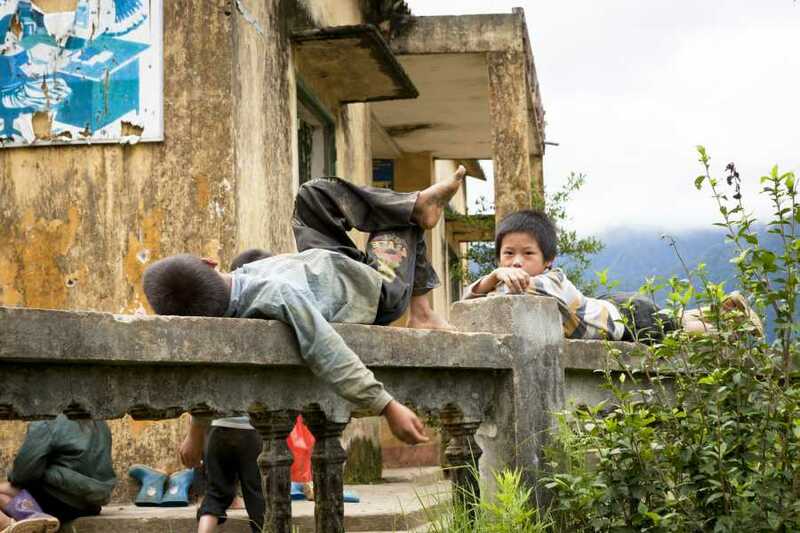 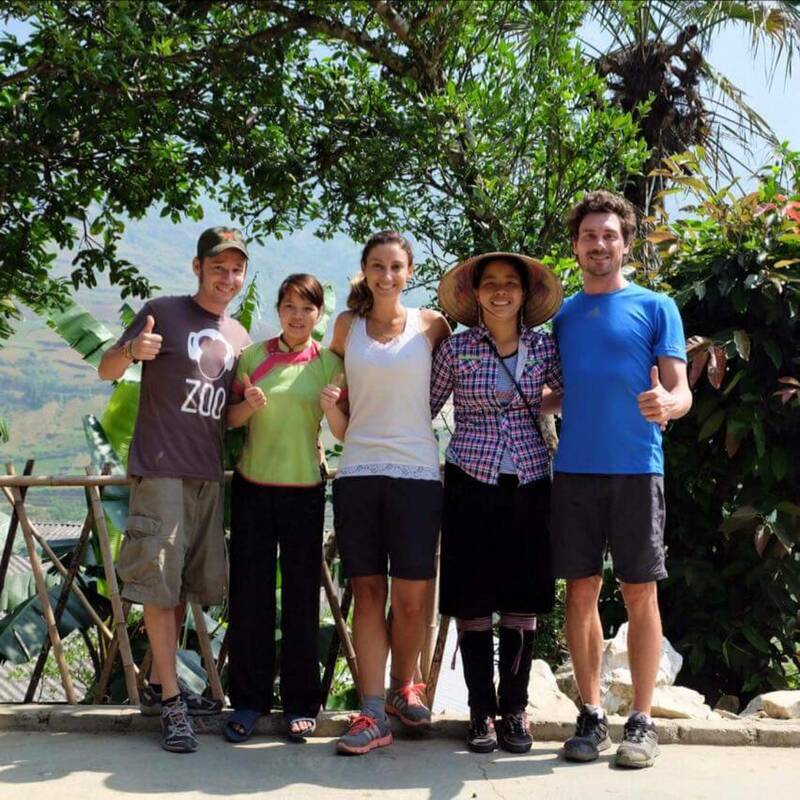 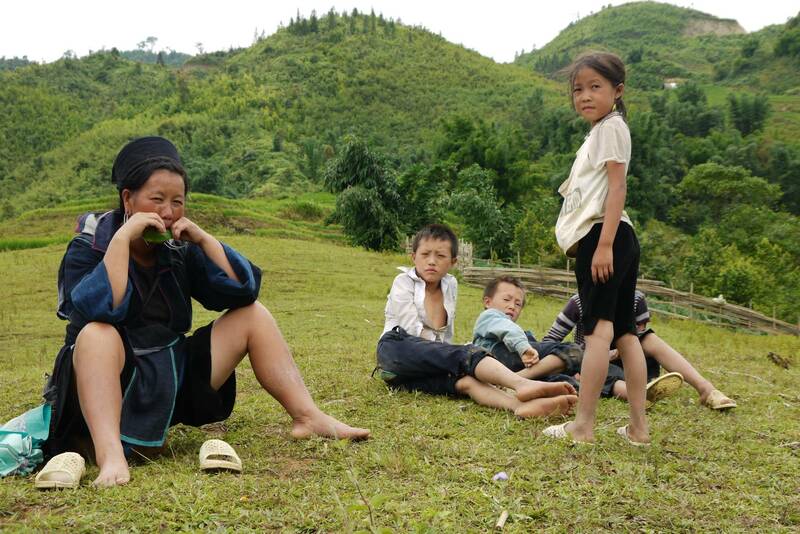 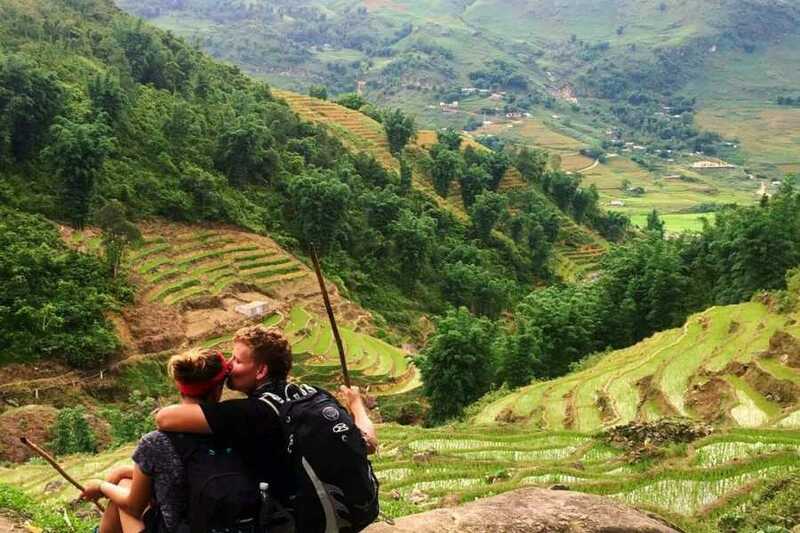 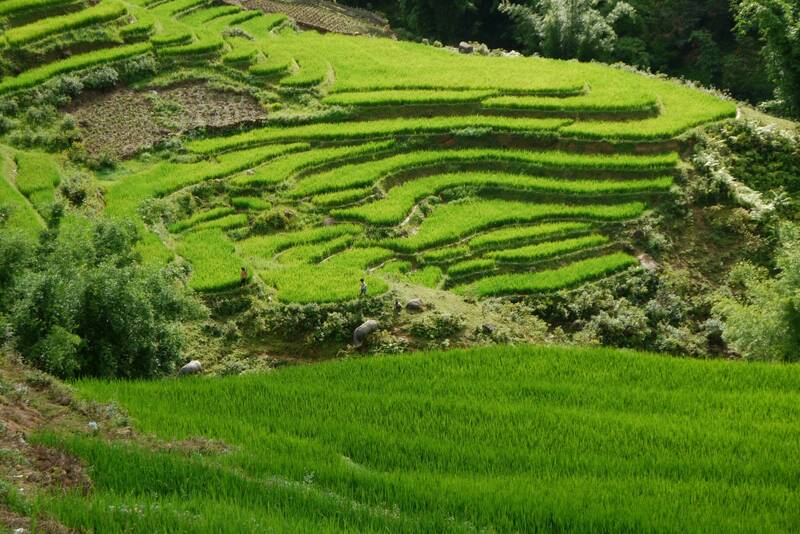 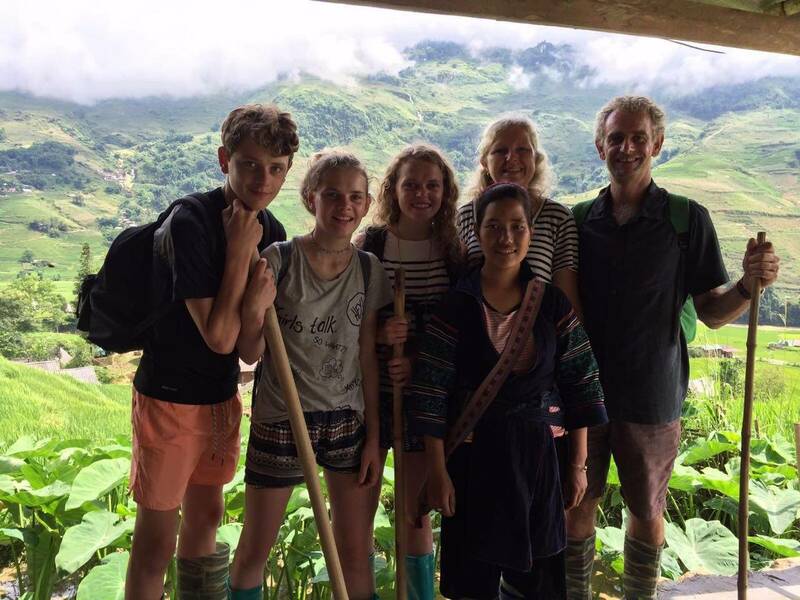 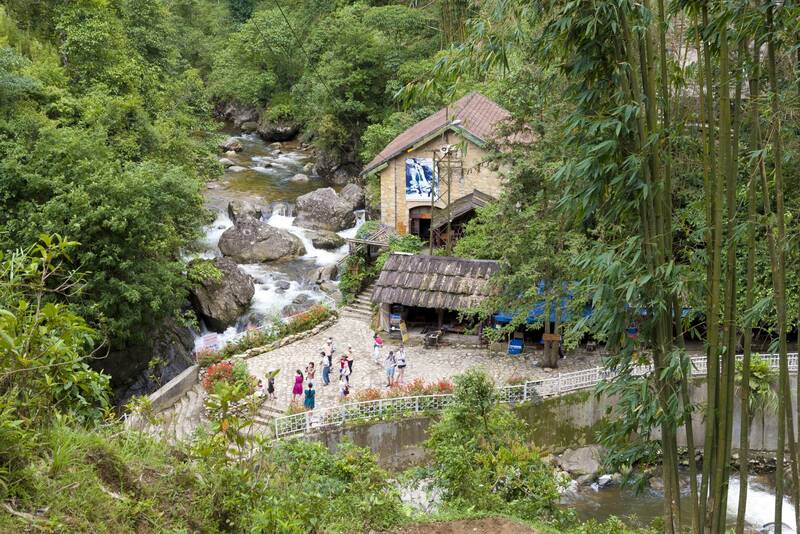 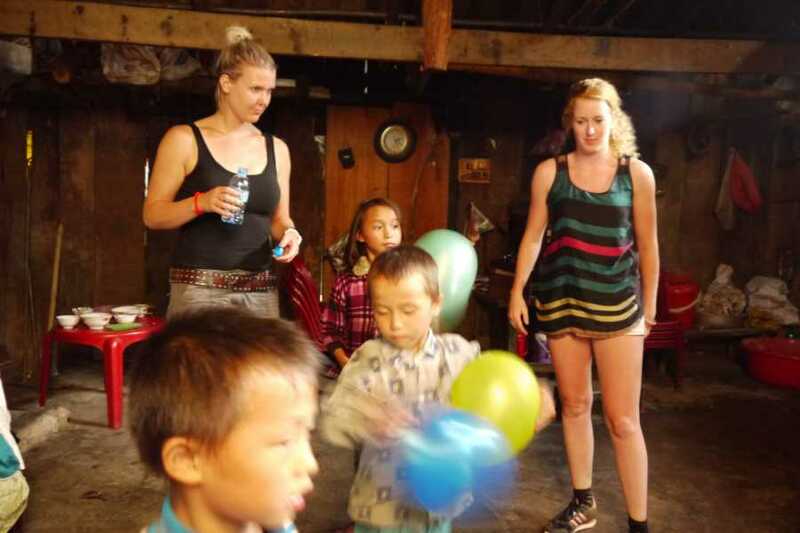 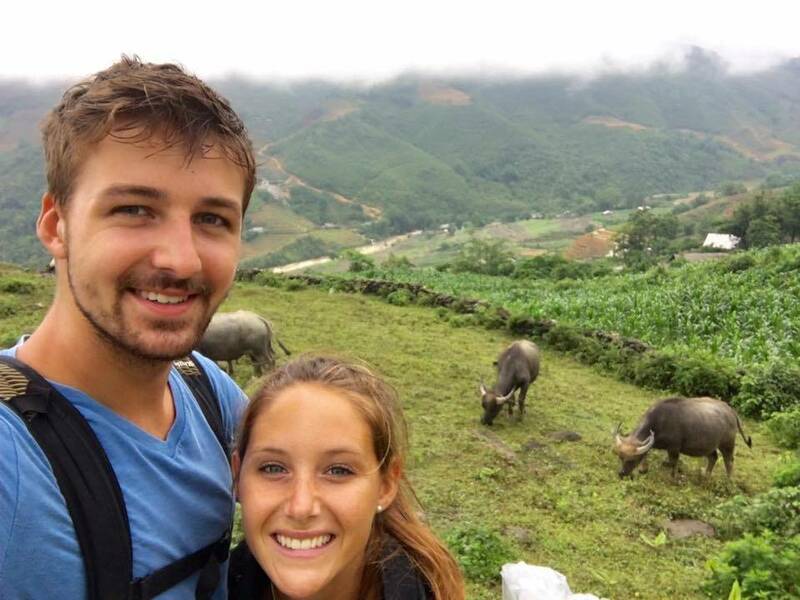 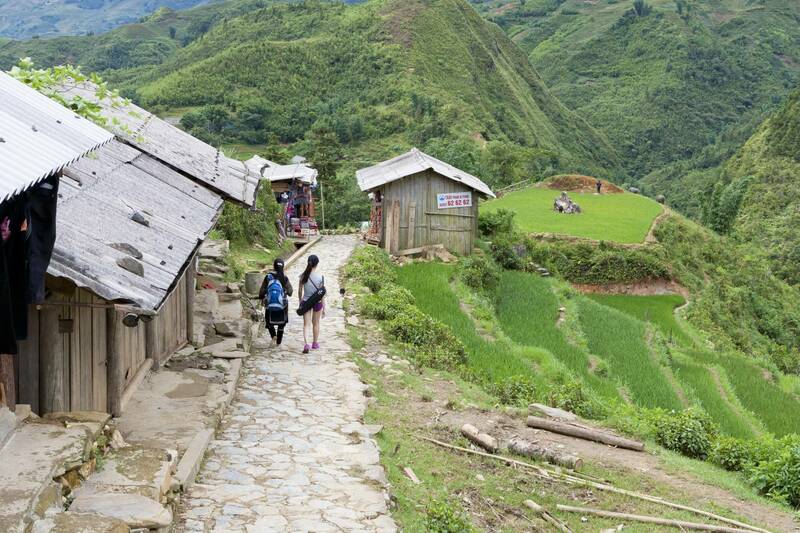 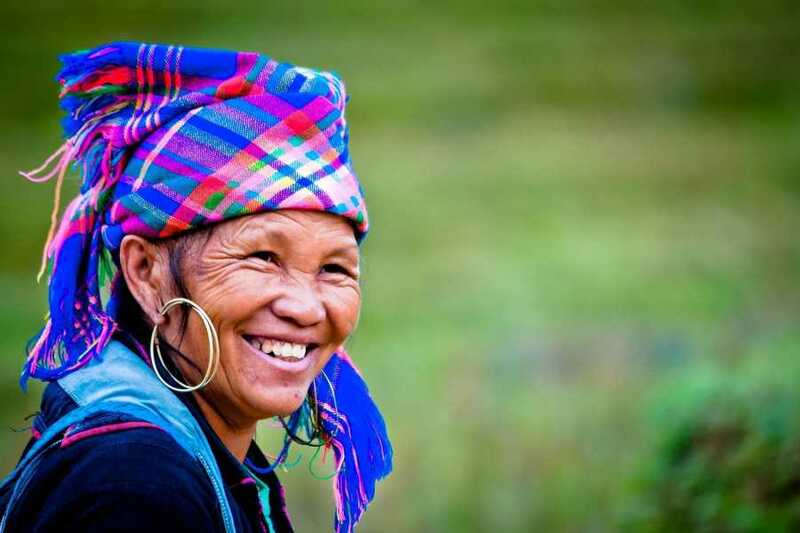 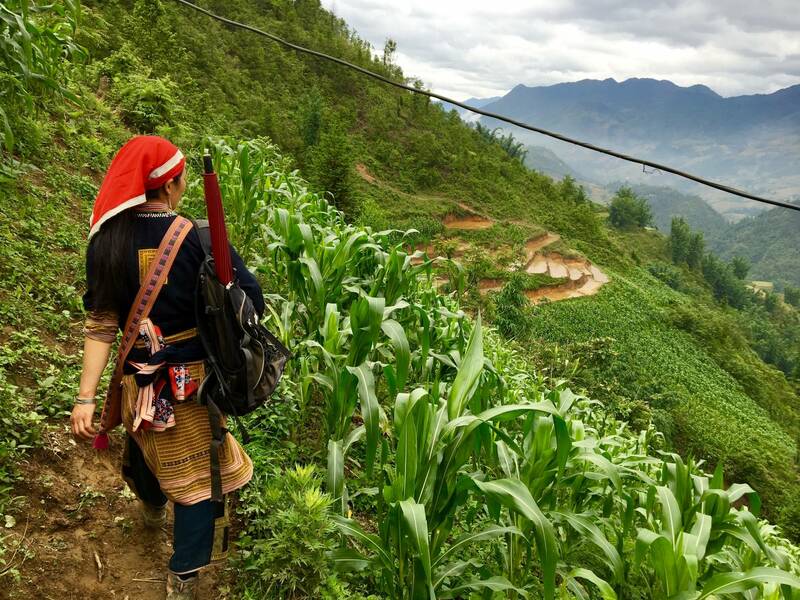 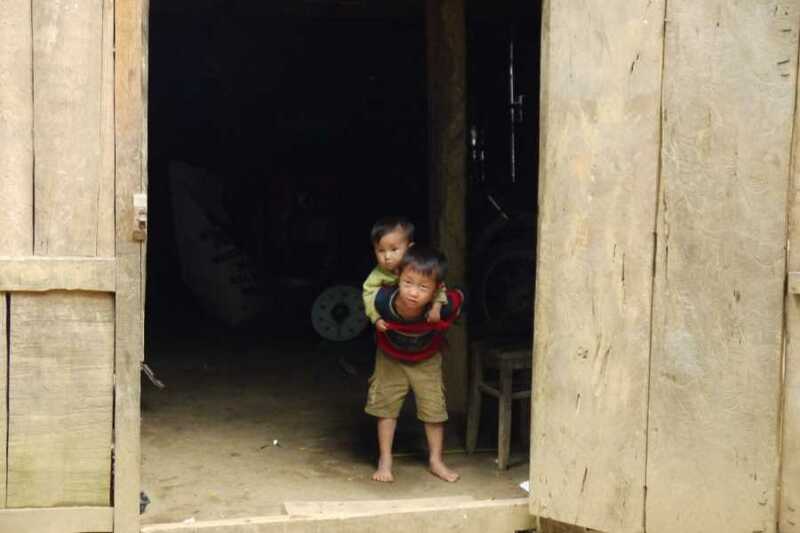 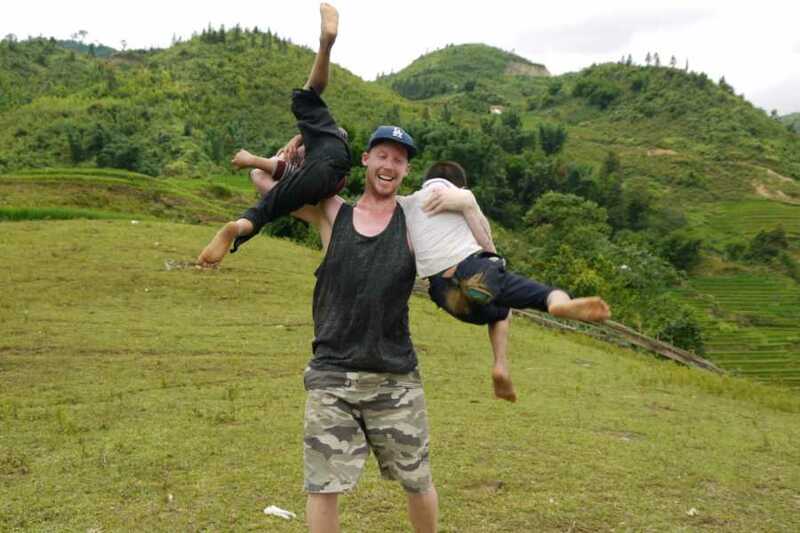 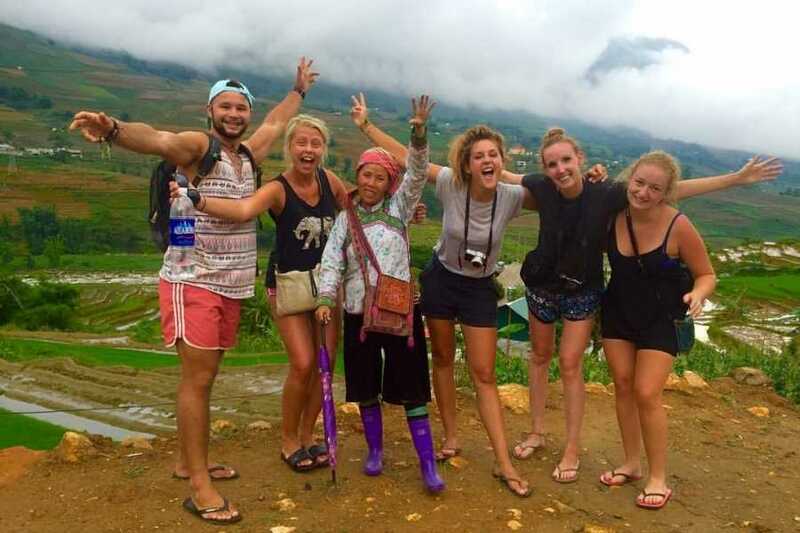 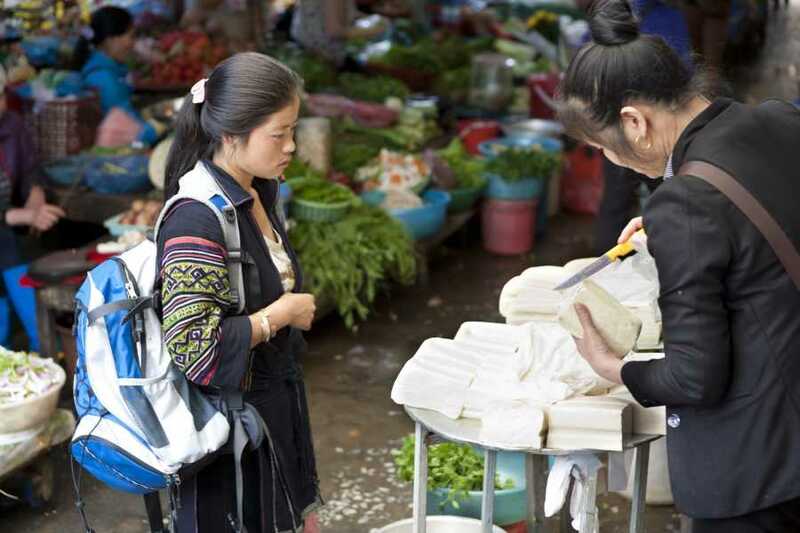 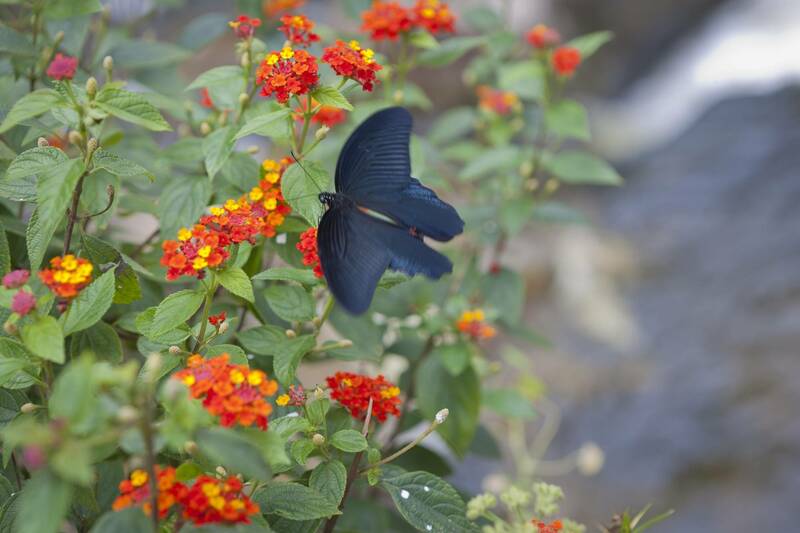 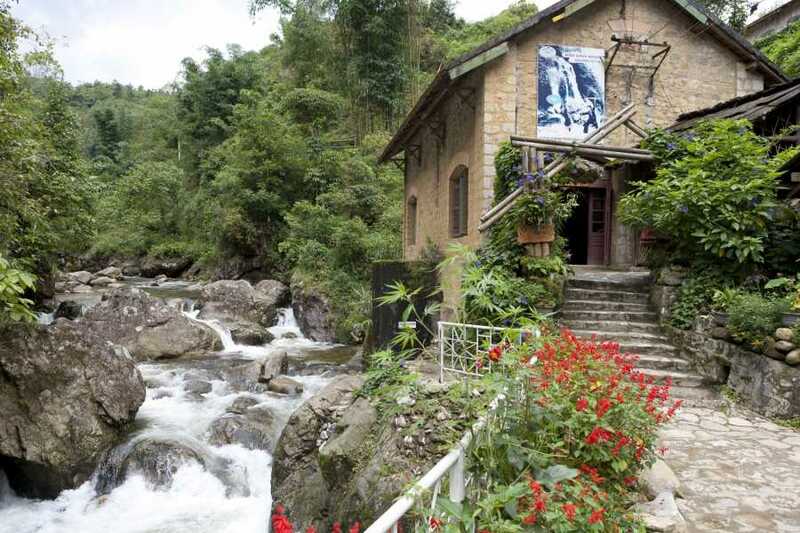 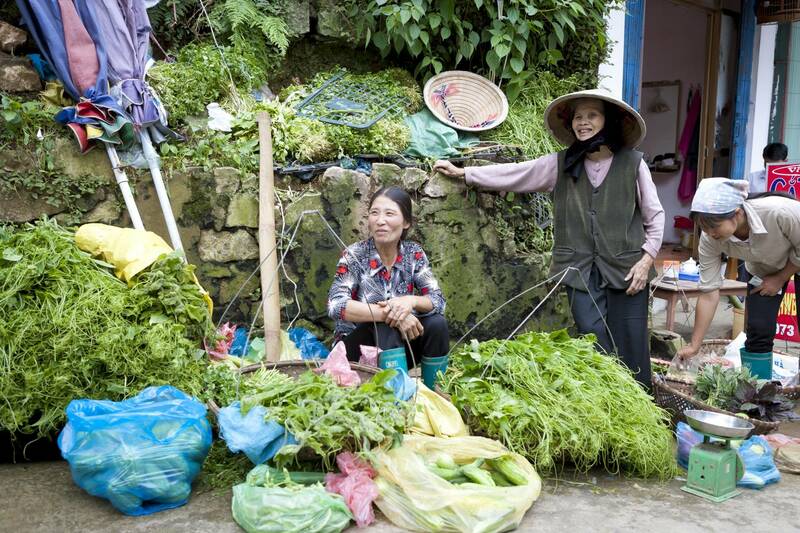 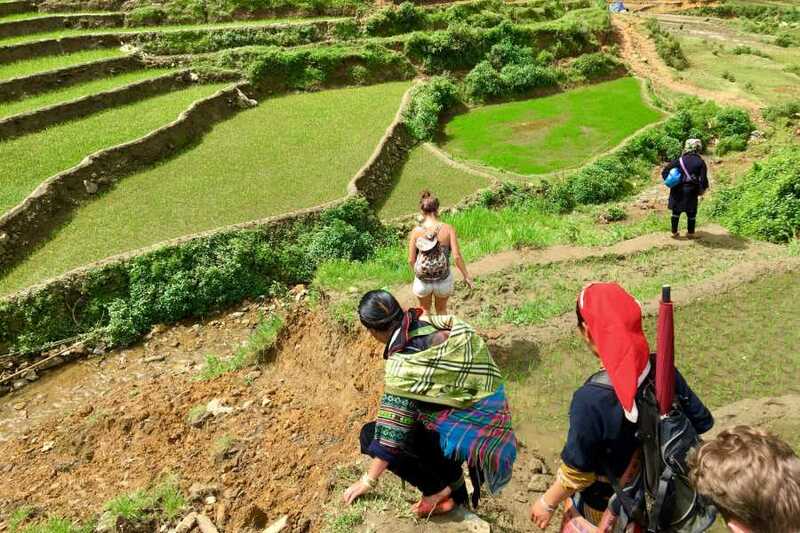 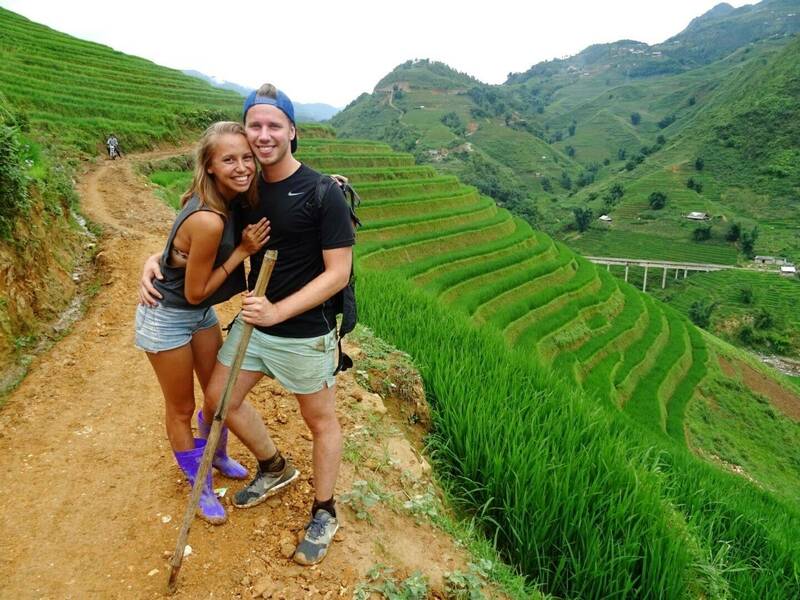 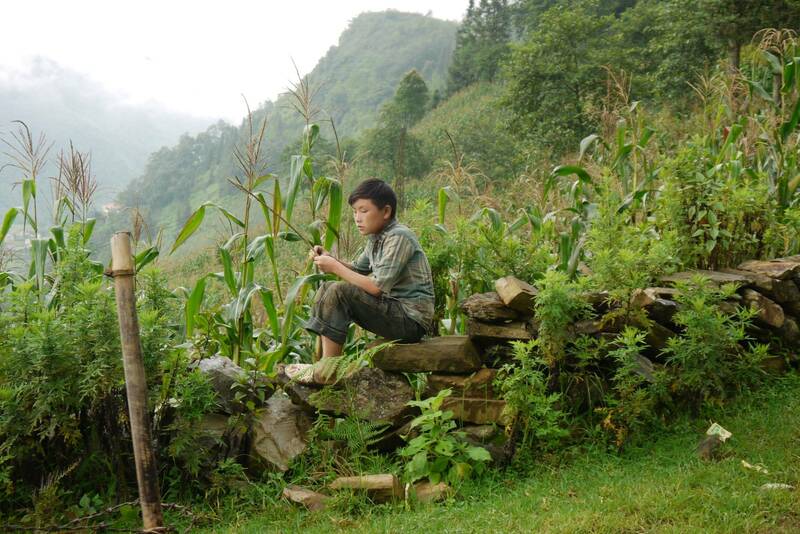 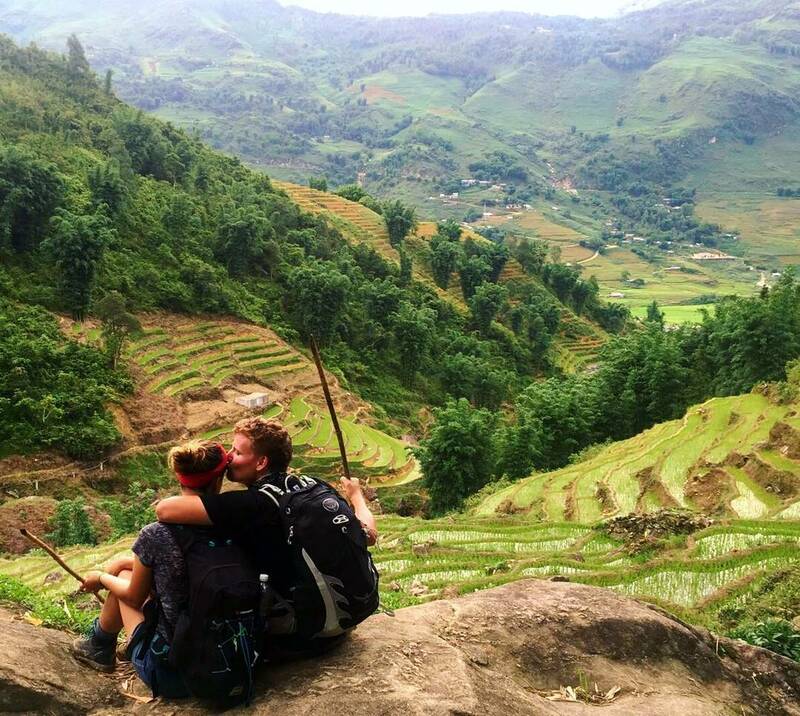 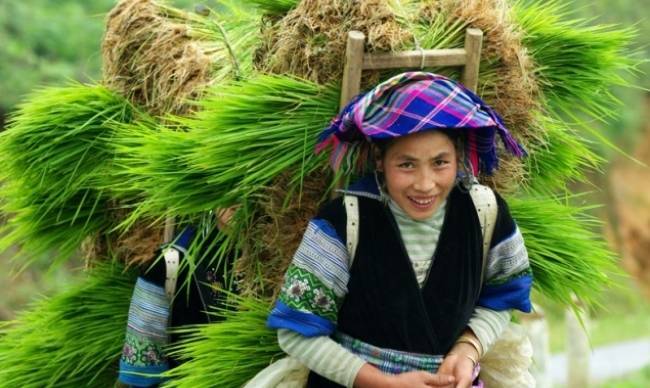 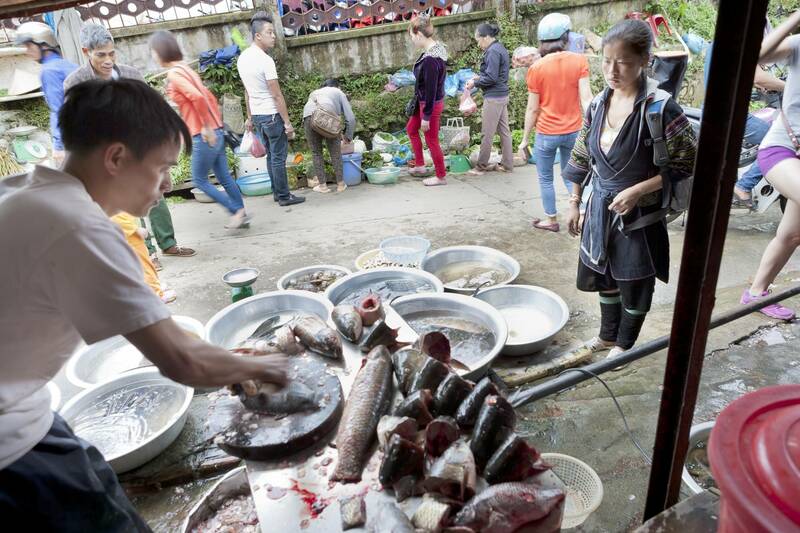 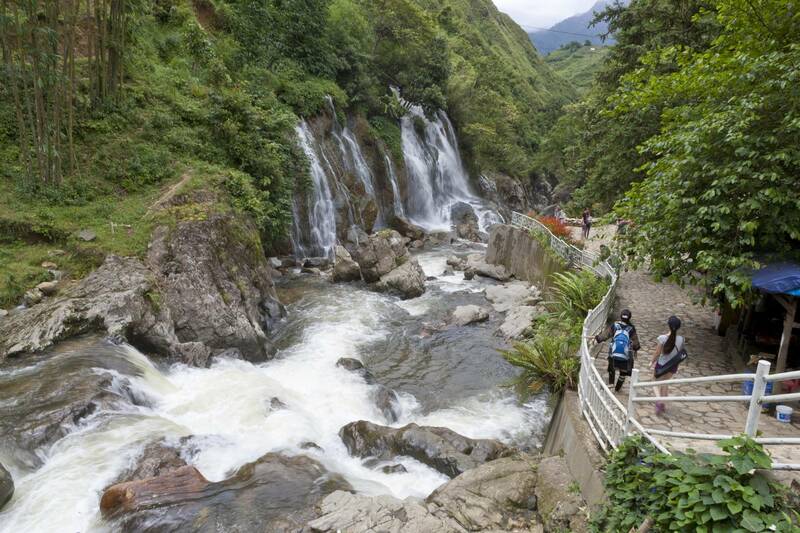 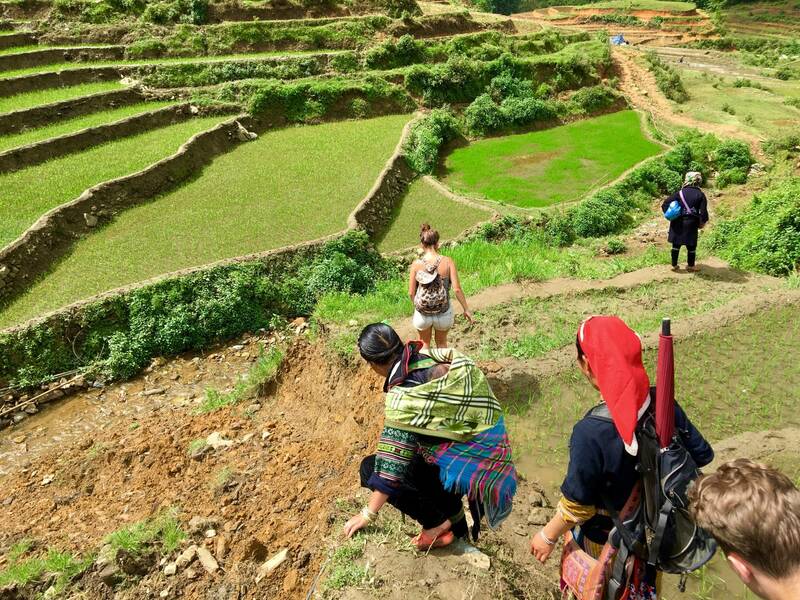 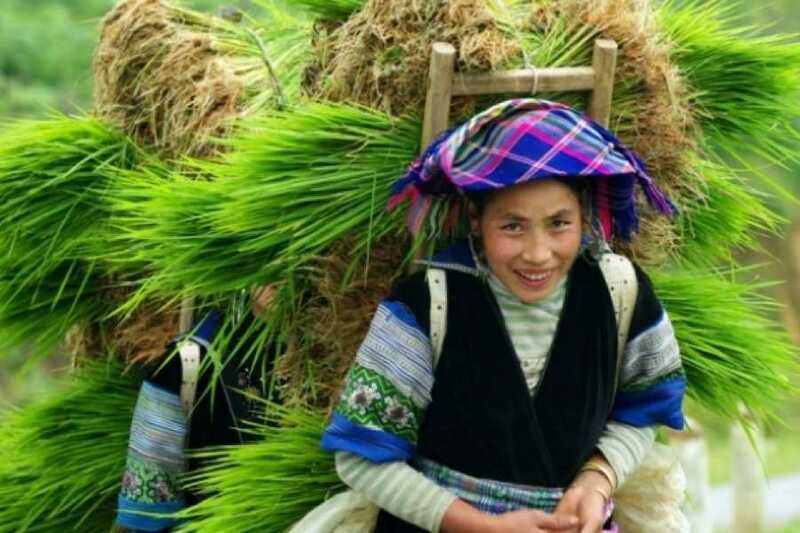 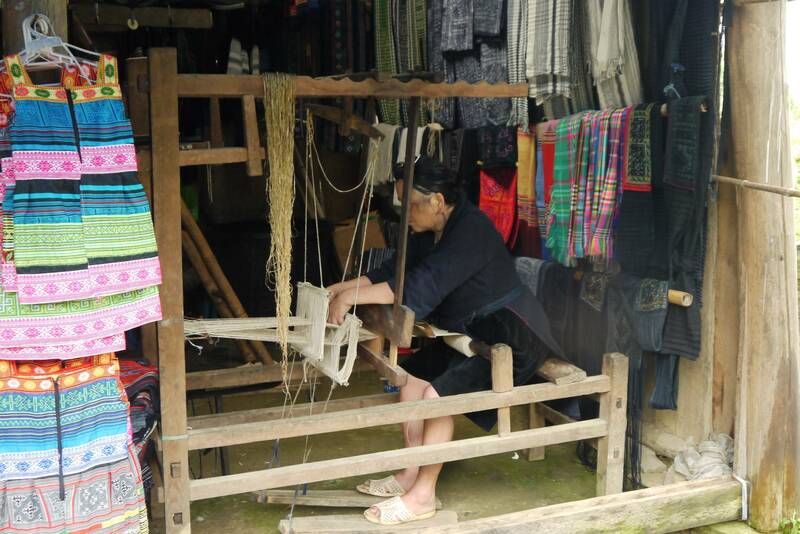 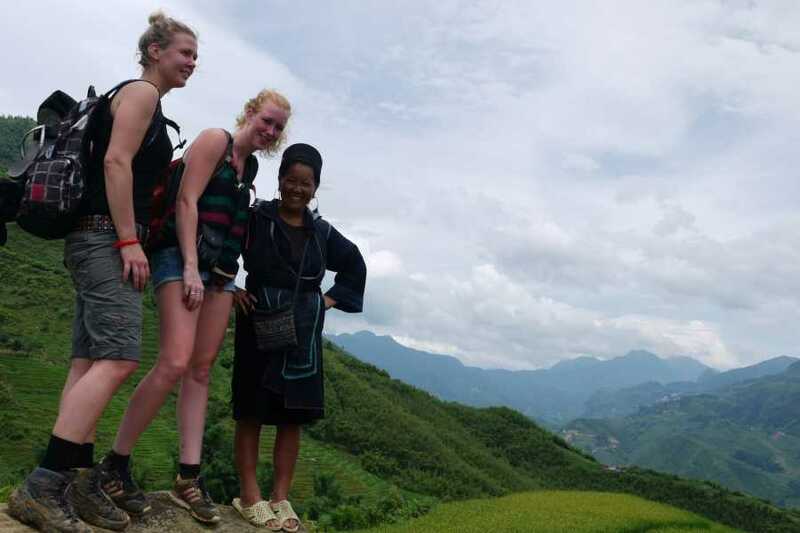 Sapa is a place you’re sure to fall in love with! 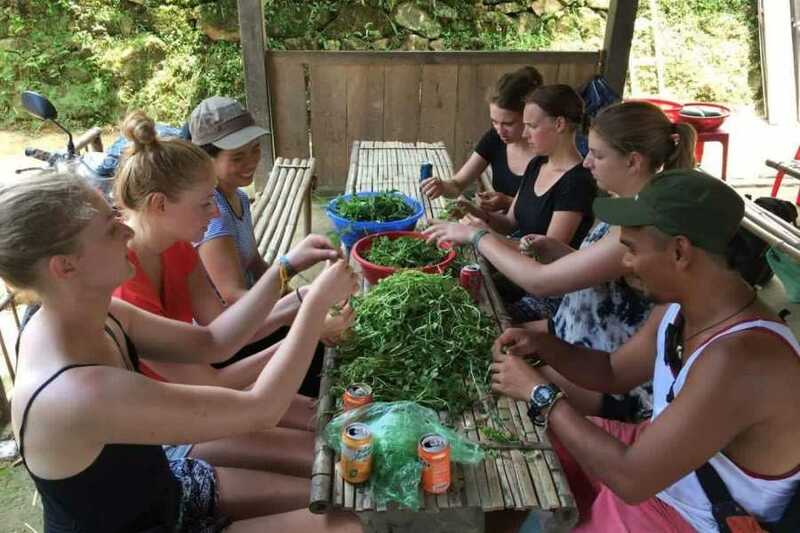 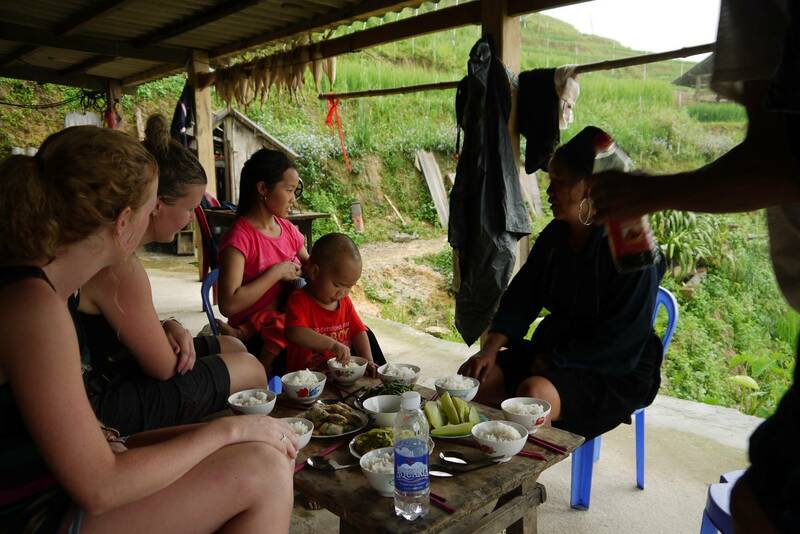 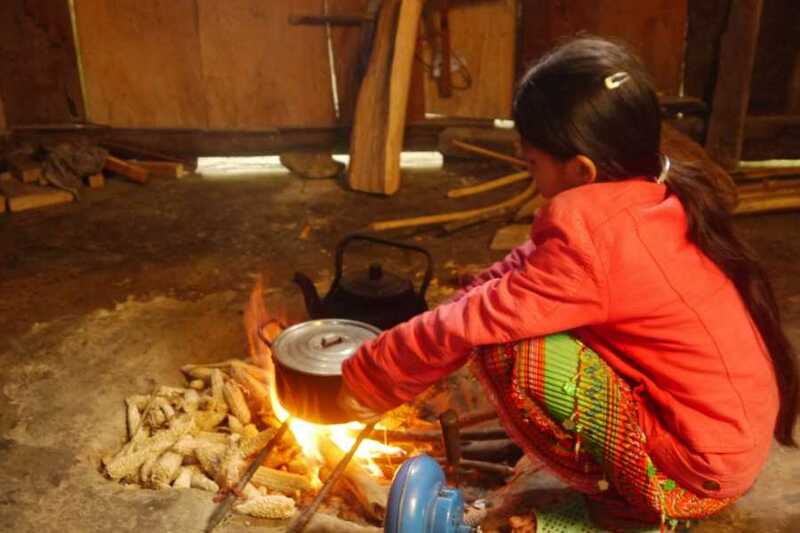 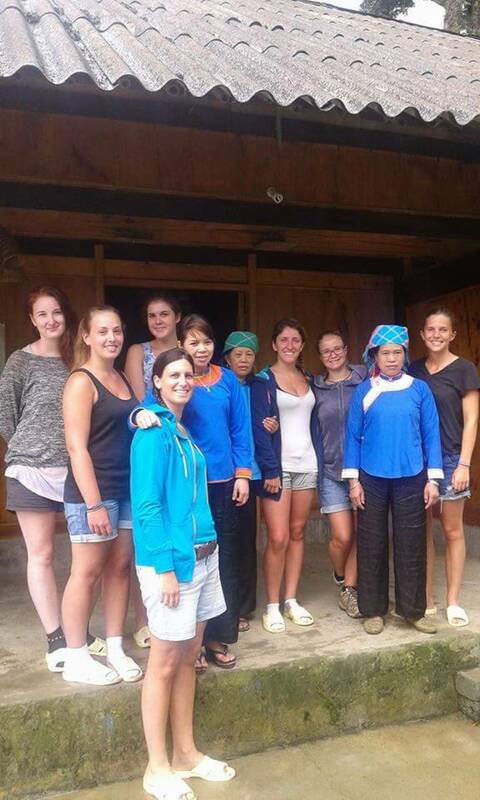 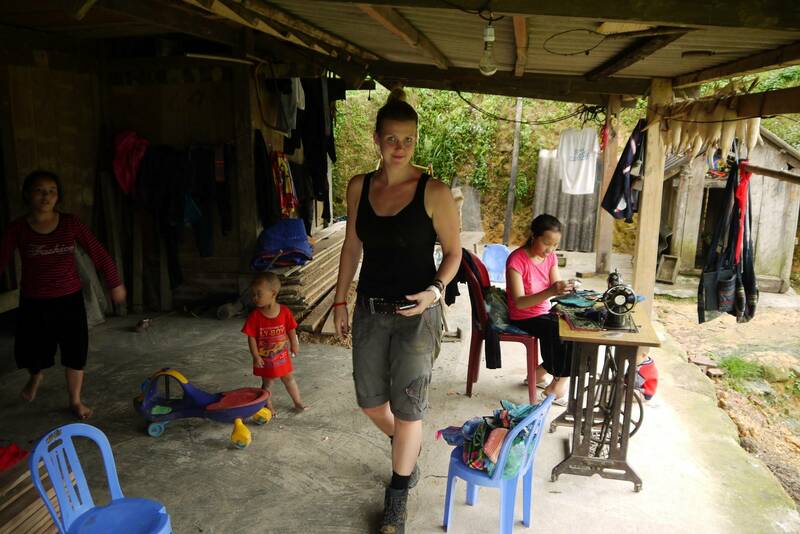 Traditional lunch will be served and after we start our trek to visit the minorities in Giang Ta Chai village. 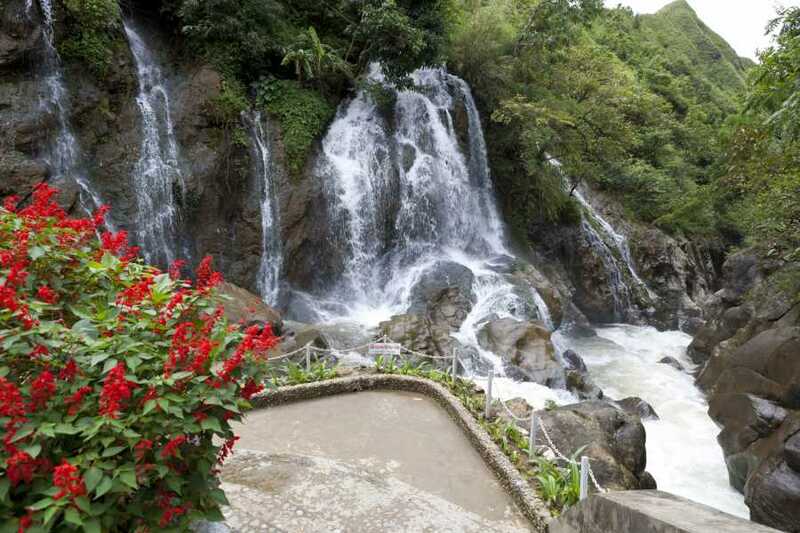 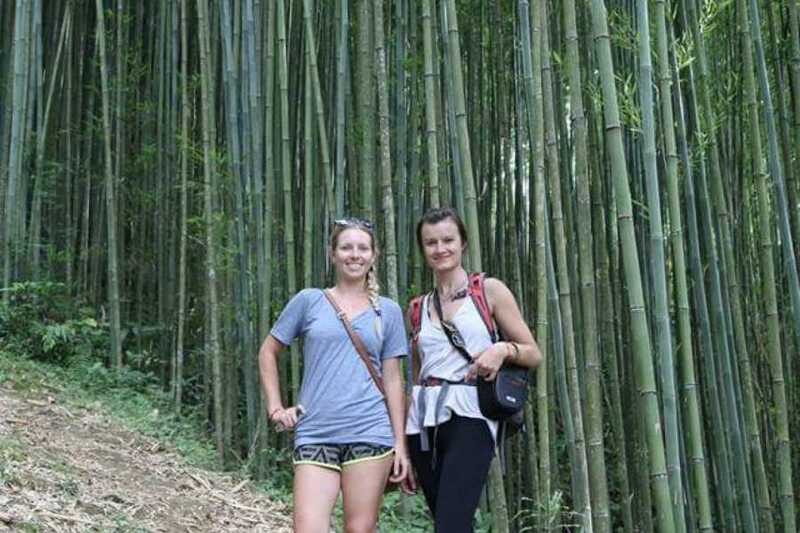 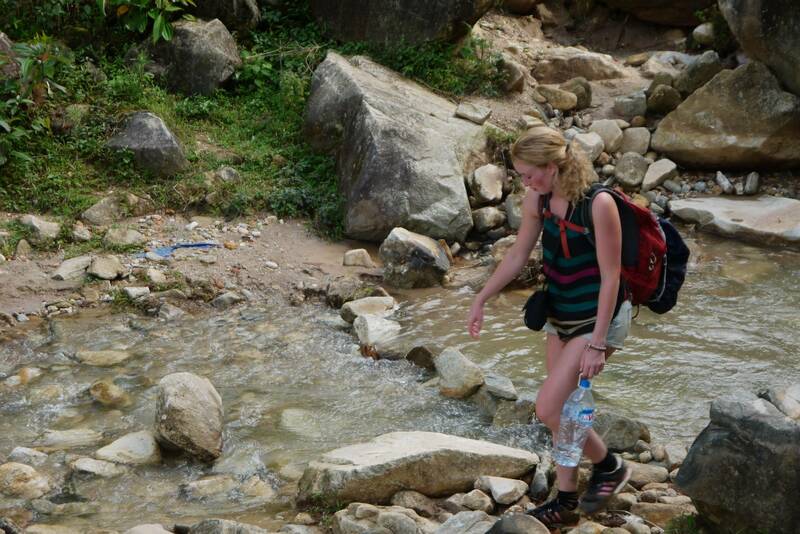 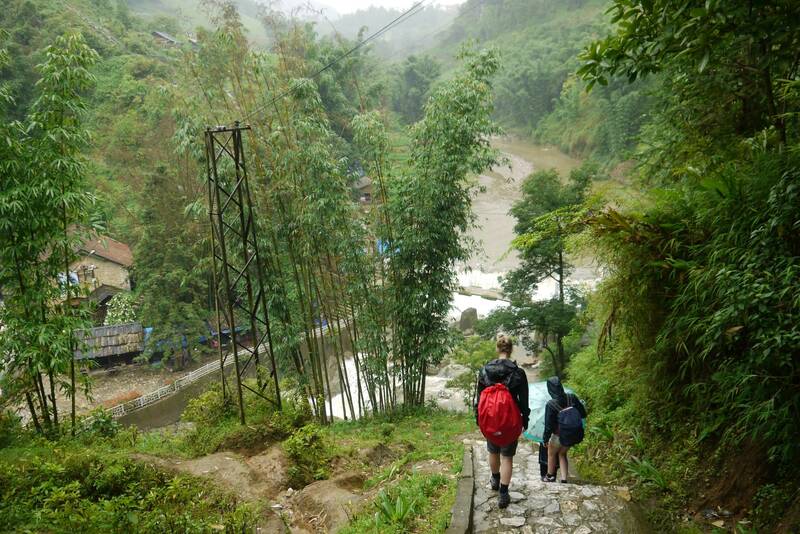 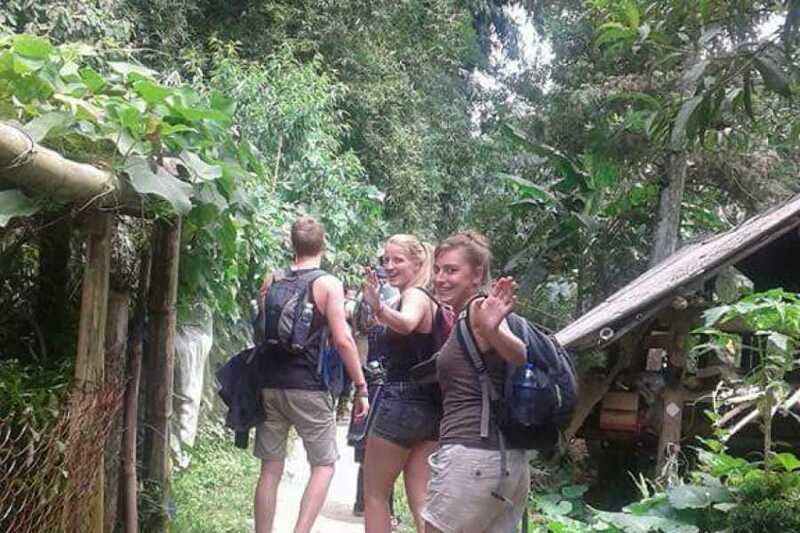 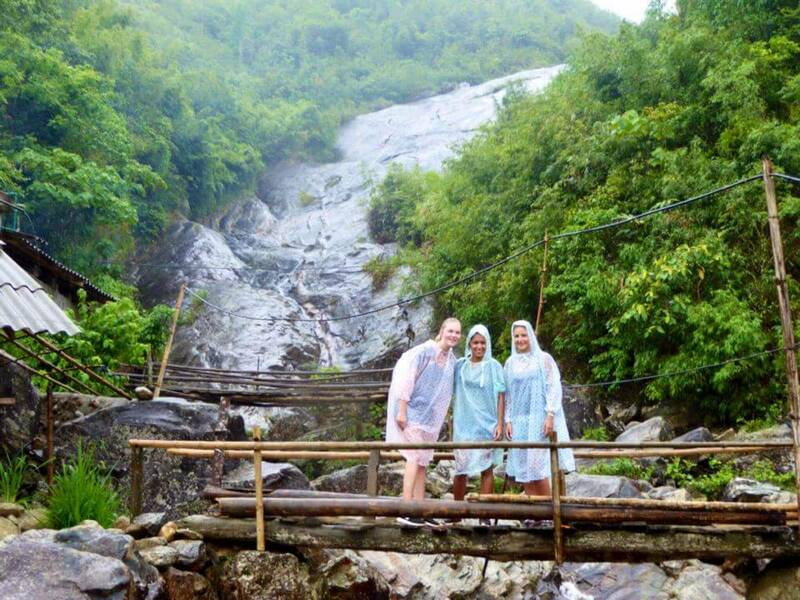 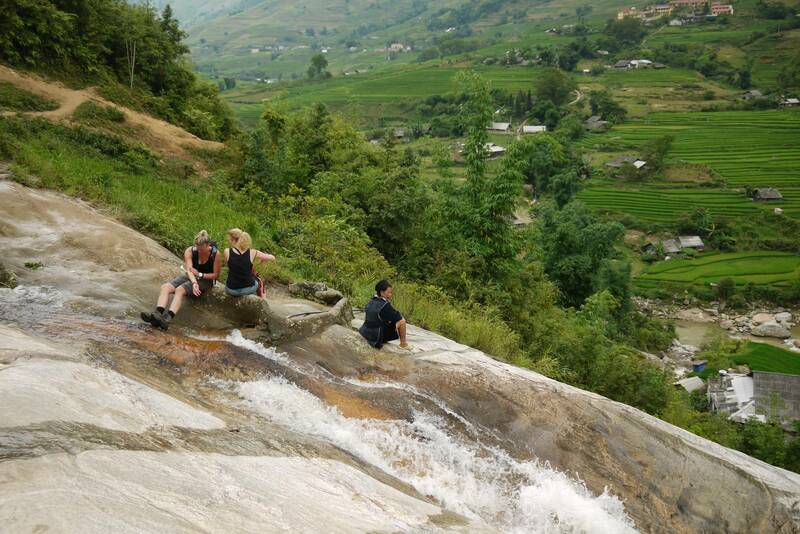 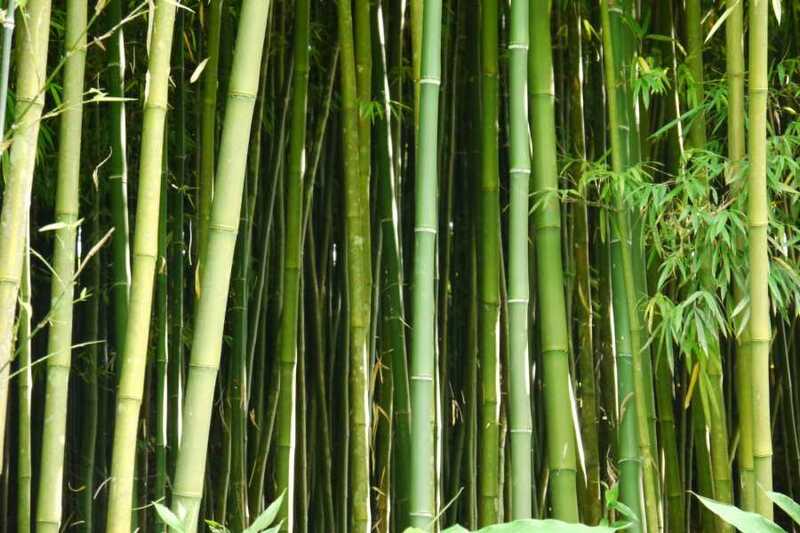 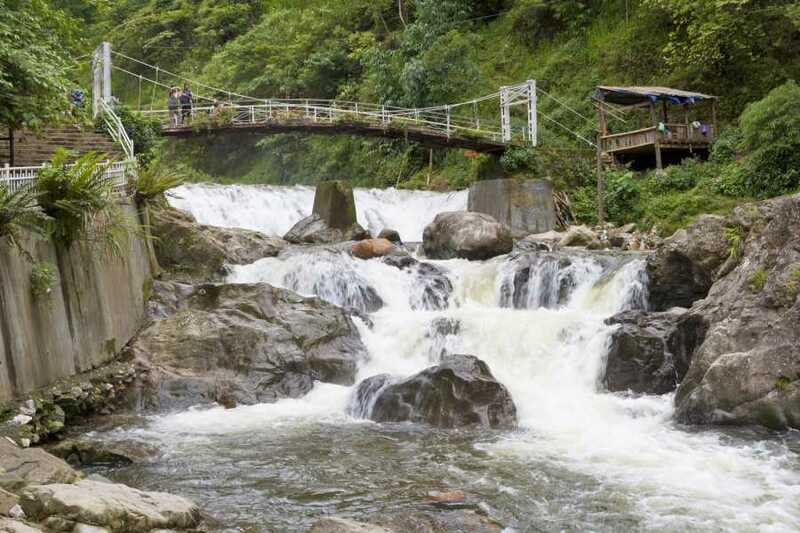 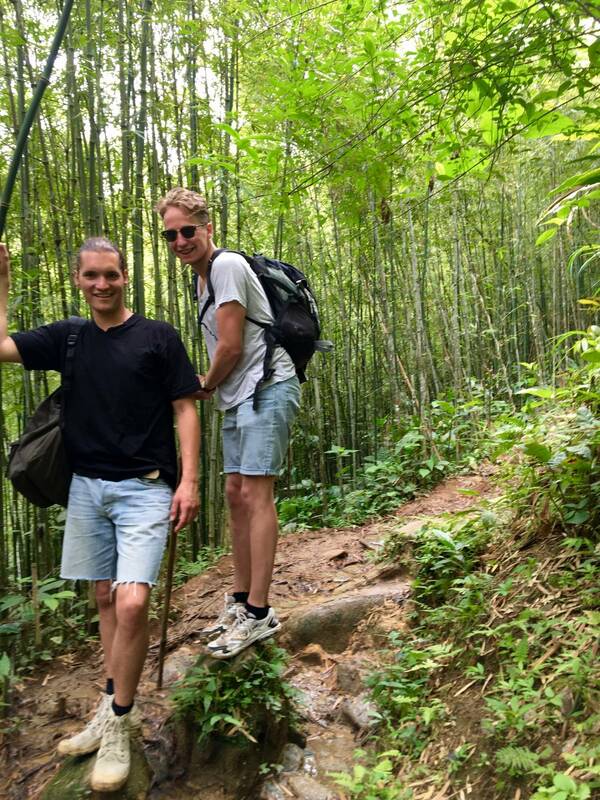 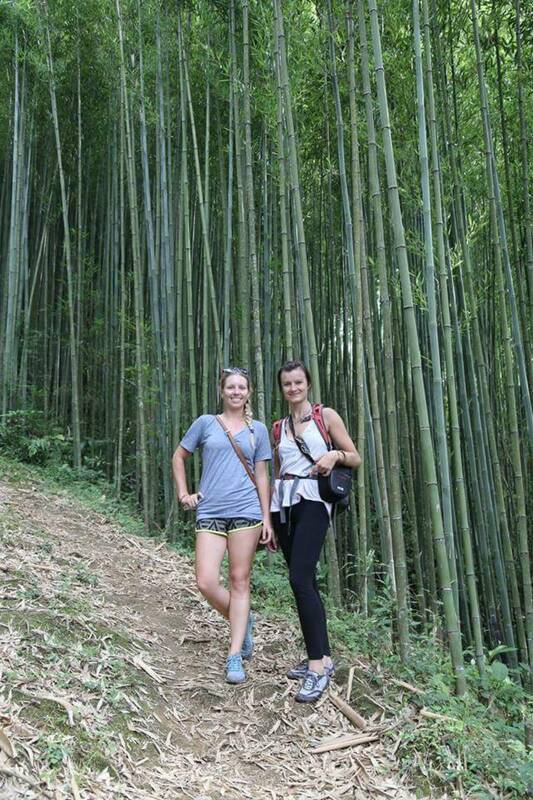 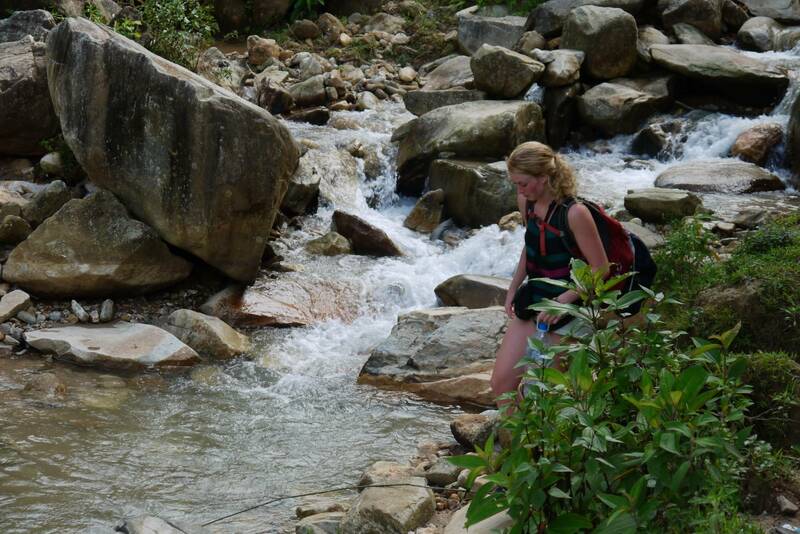 We pass bamboo forest and stunning scenery and a lovely waterfall along our route. 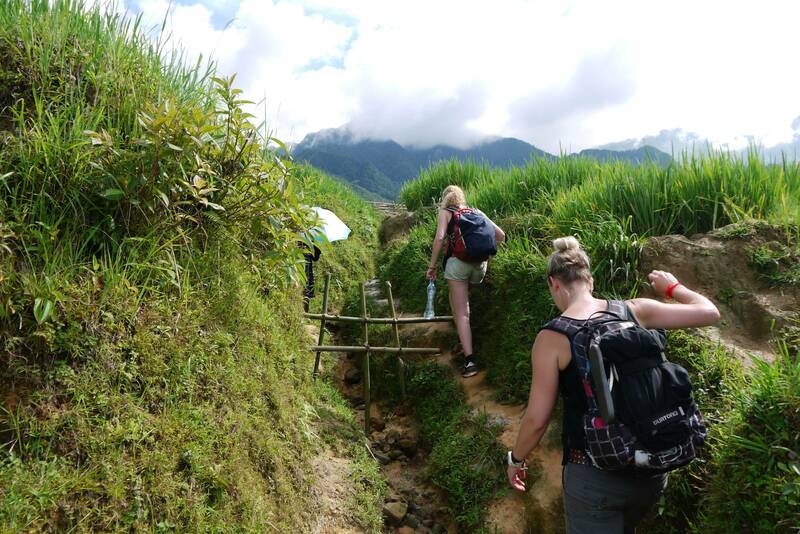 The terrain can be steep at times and slightly challenging. 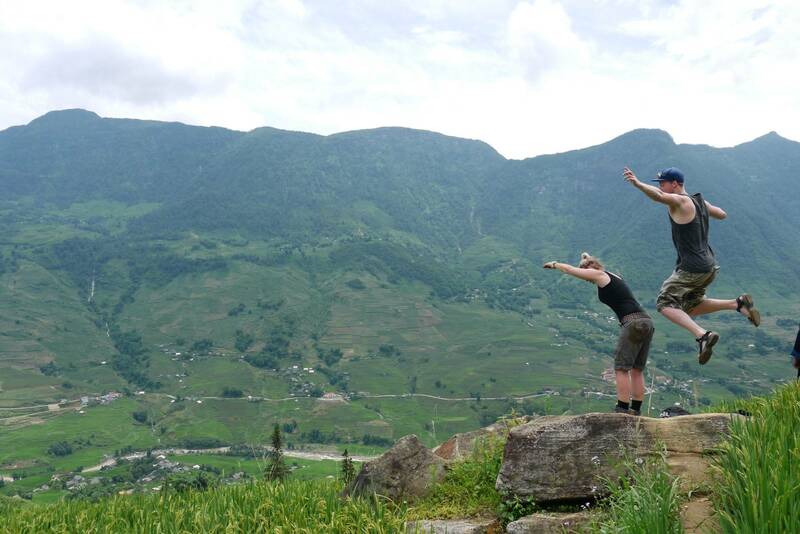 However, passengers with a moderate fitness level should be fine. 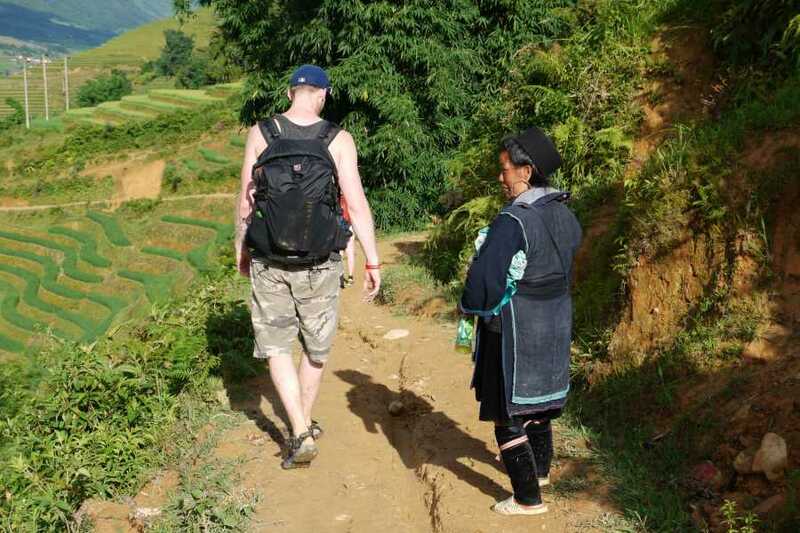 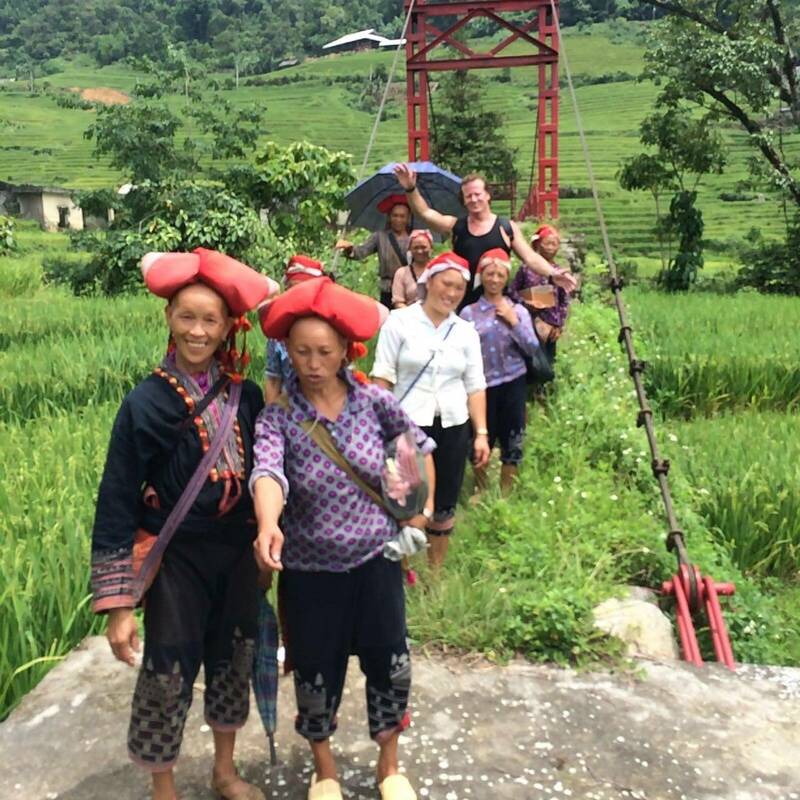 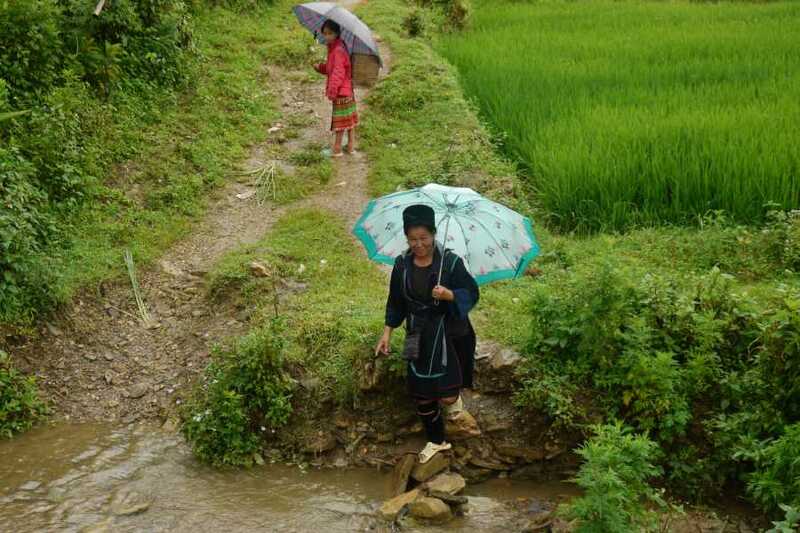 Our journey leads us along the small paths edging the rice fields, across the Muong Hoa River will be on the way at a fantastic spot. 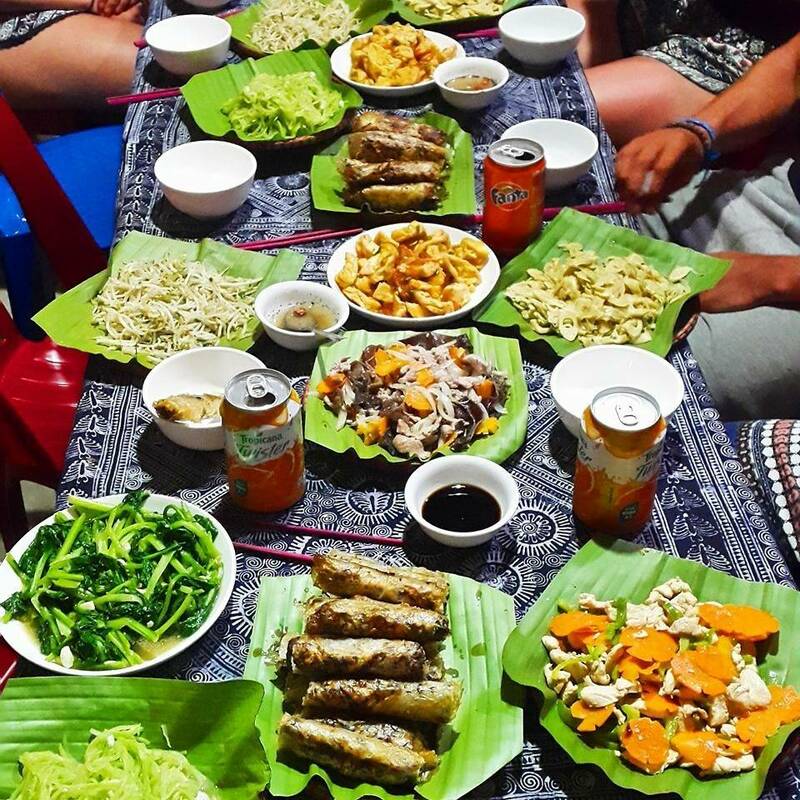 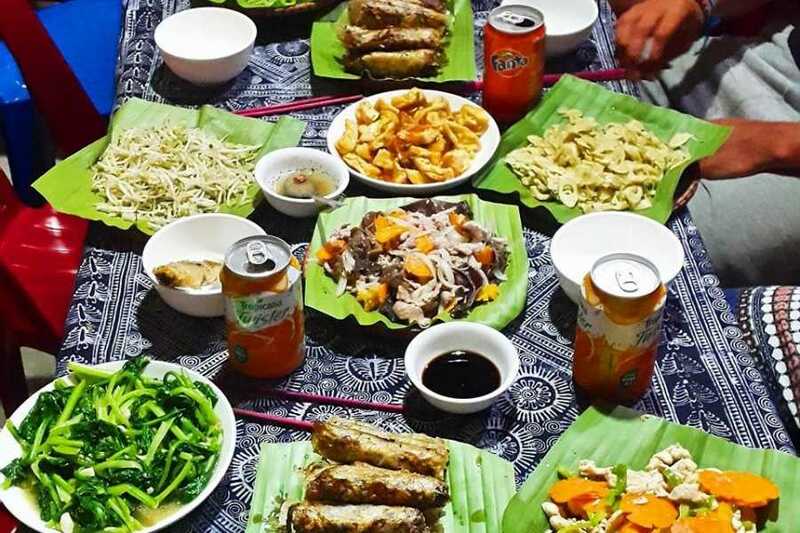 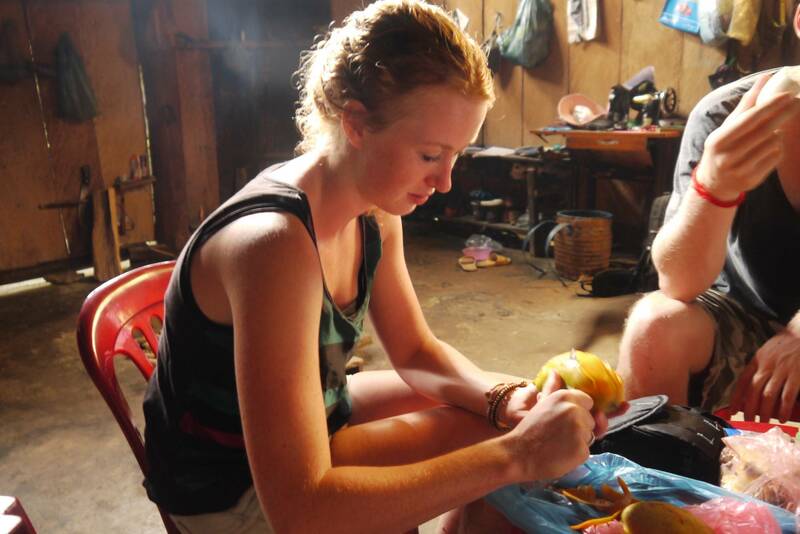 Traditional meals with a local family. 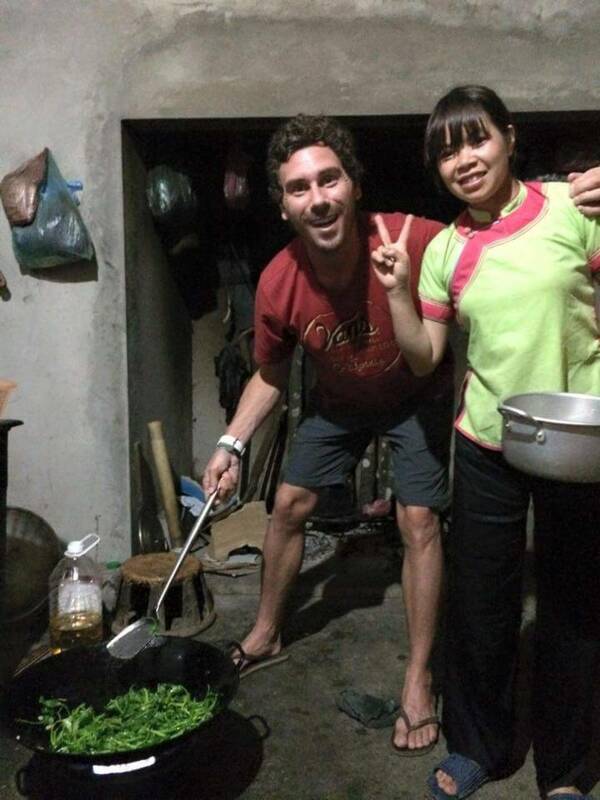 Cook & prepare the food with the family on the traditional way, enjoy 30 min foot massage. 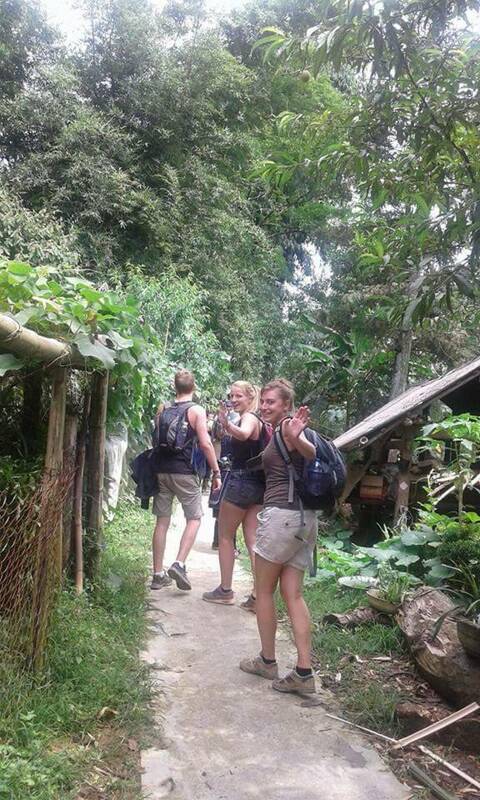 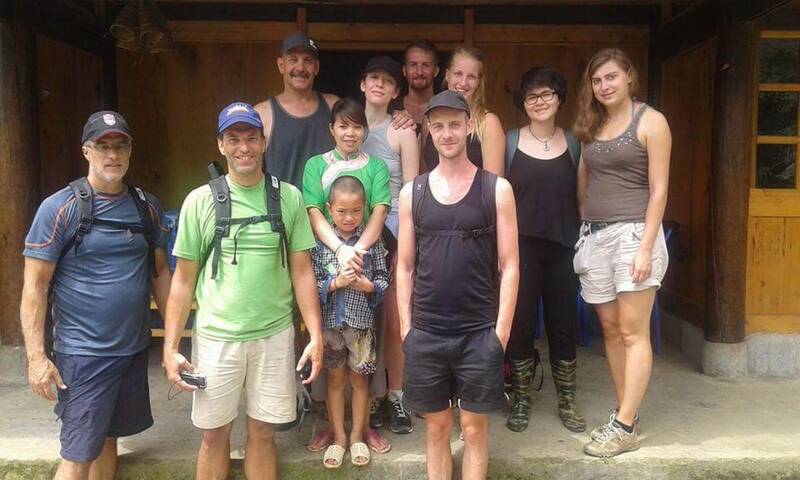 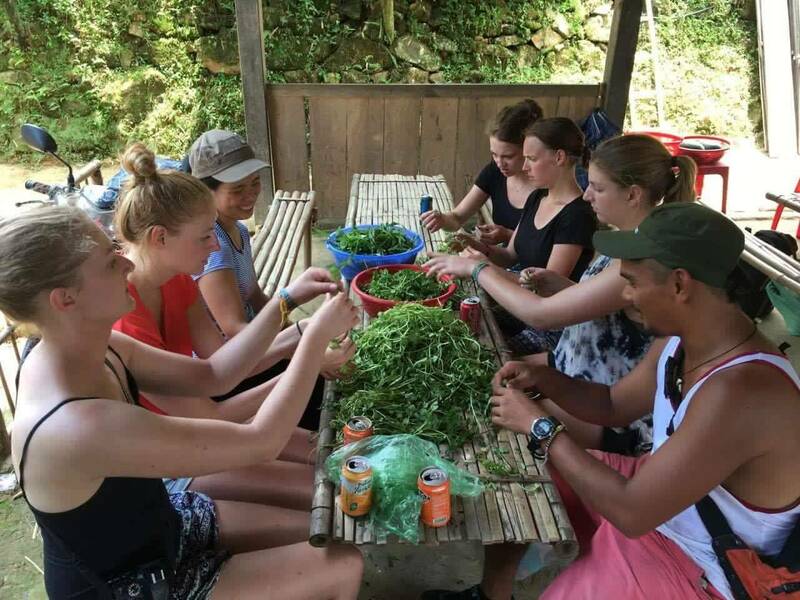 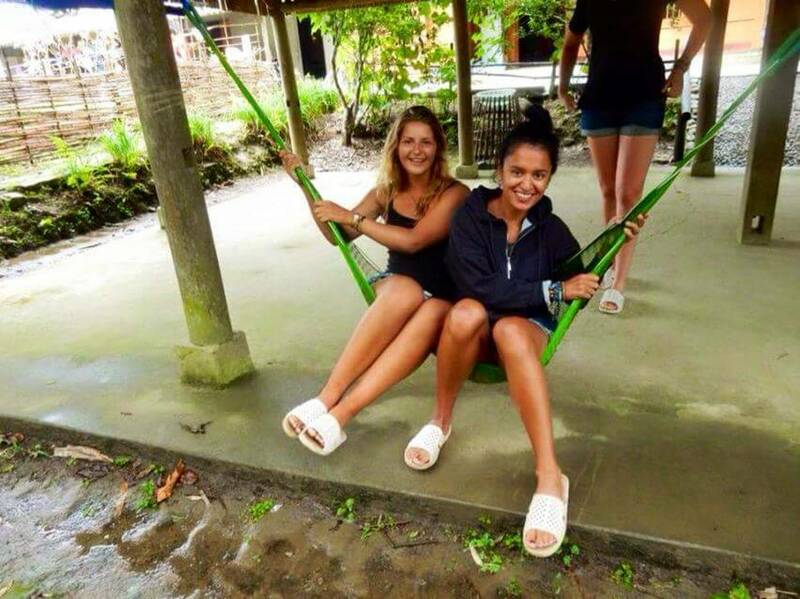 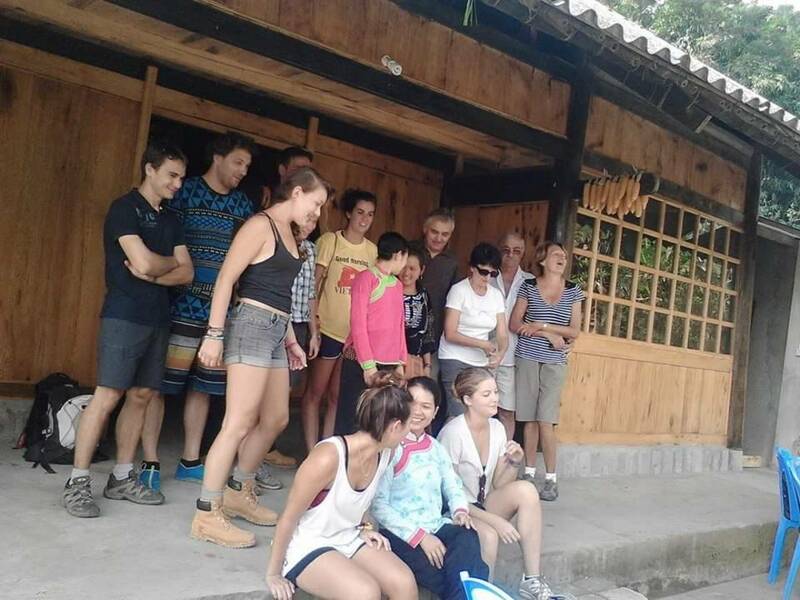 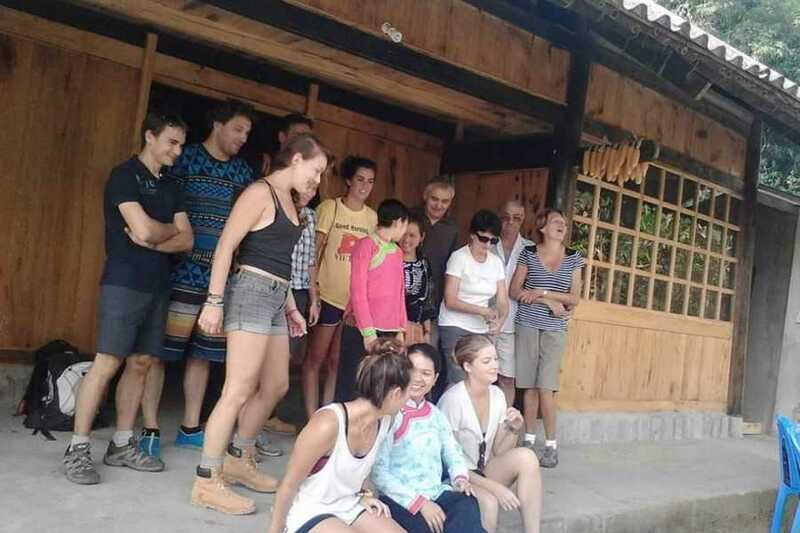 Rise and shine…Enjoy our breakfast at our homestay today we start early at 8 AM so be prepared for your trek as your tour starts at 8:00 AM. 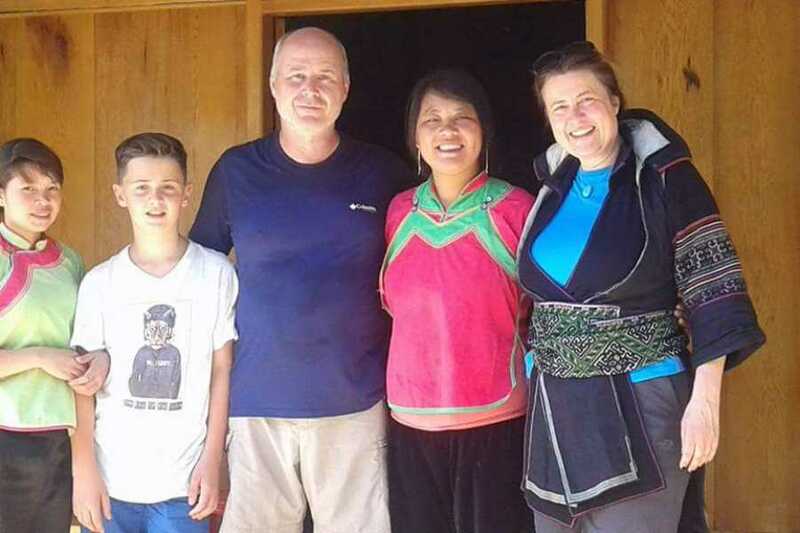 Today we might see many diverse groups like the Dzay, Dzao, Tay, Xa Pho or Hmong populate this richly cultural northern territory. 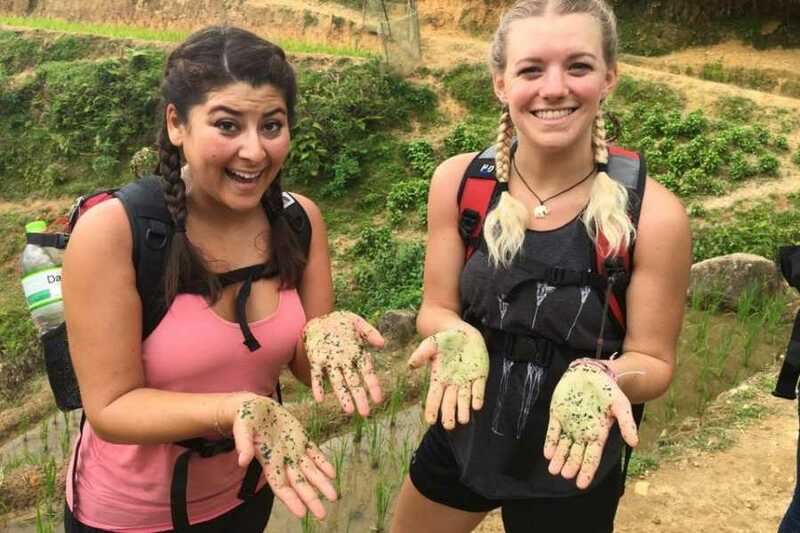 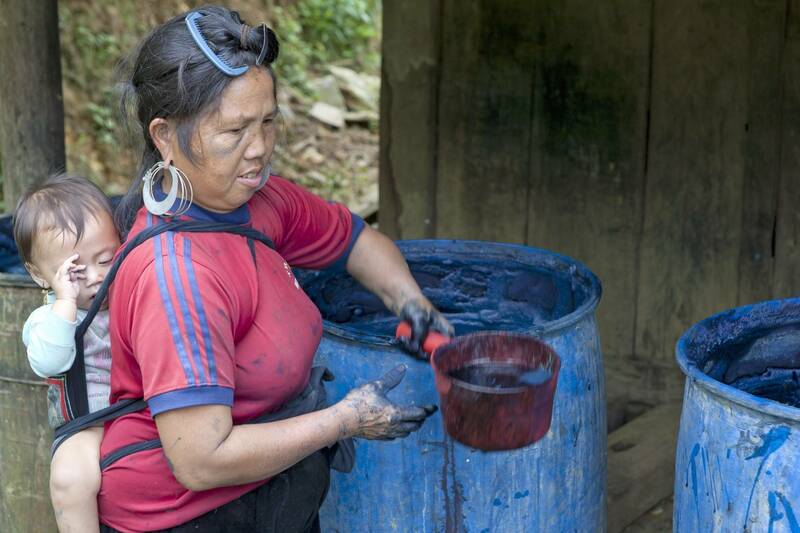 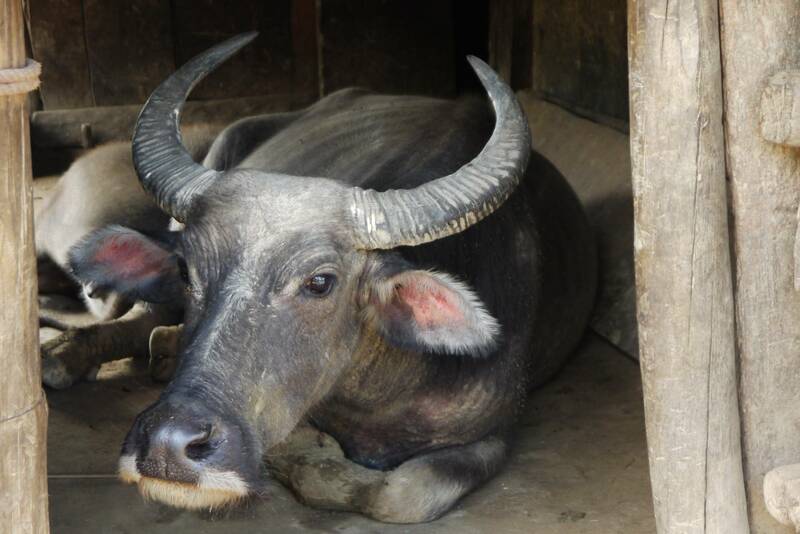 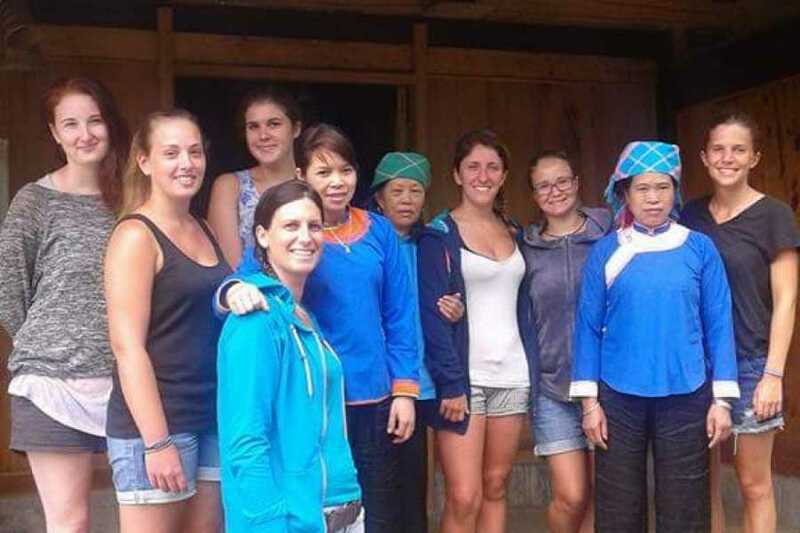 You’ll sample their unique delights as you pass through each village where we trek on the rice paddy fields and buffalo tracks on a less-non touristic unique.